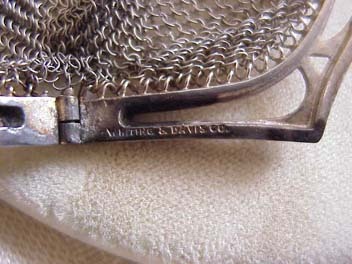 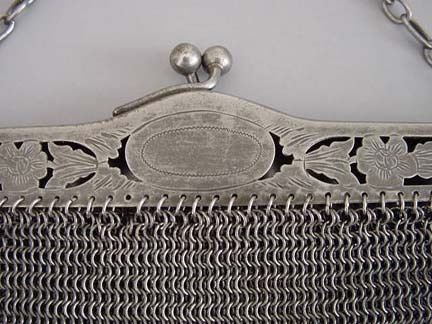 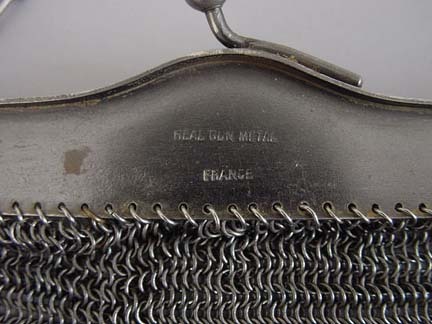 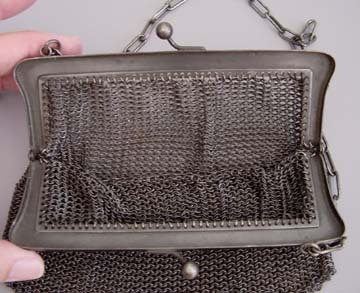 While mesh bags were hand made in the 1800's, the invention of the mesh making machine in 1909 made them more readily available. 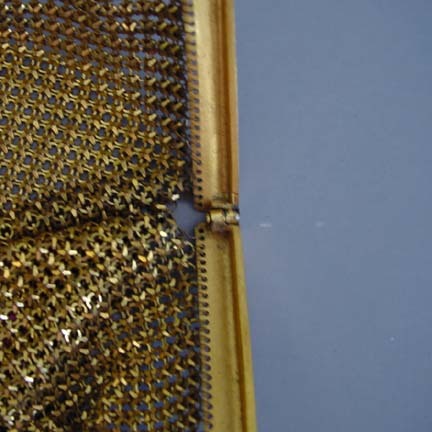 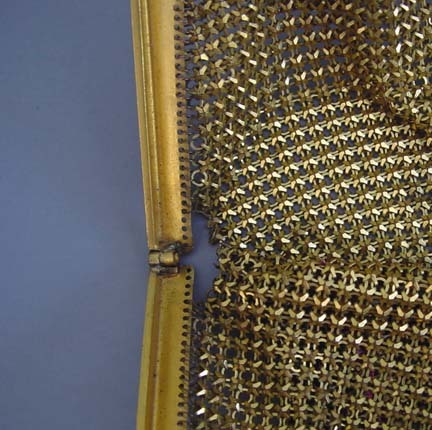 There are many types of mesh, some of which are: ring mesh; Dresden mesh; baby mesh; fish scale mesh; and enameled mesh. 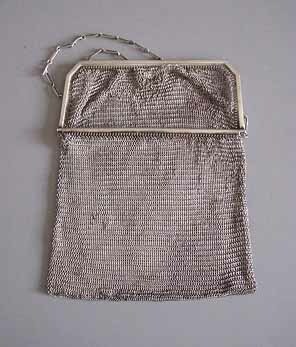 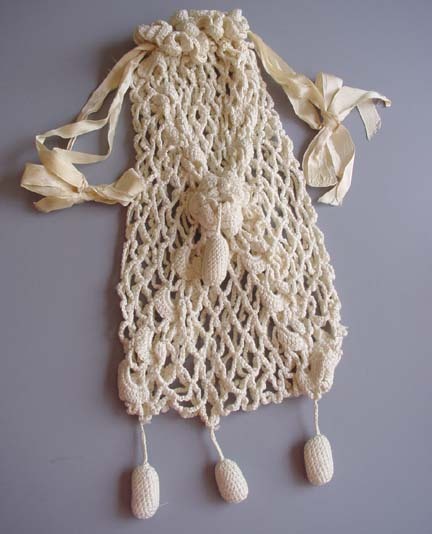 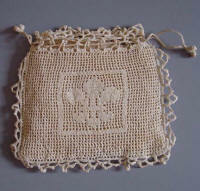 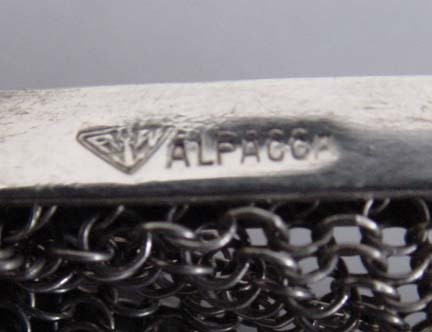 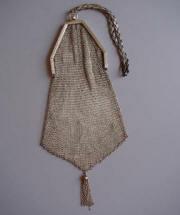 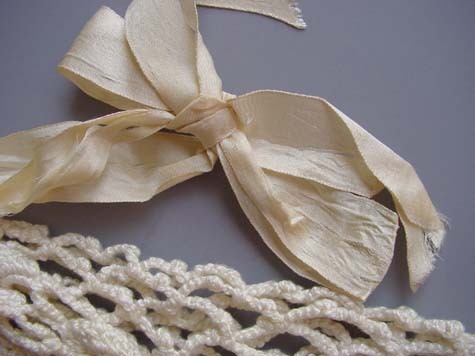 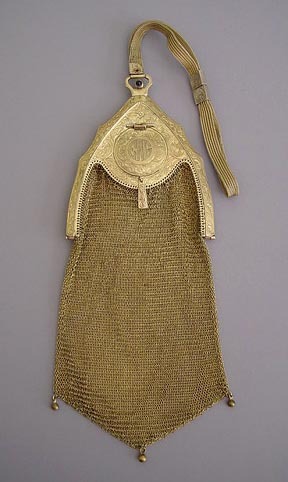 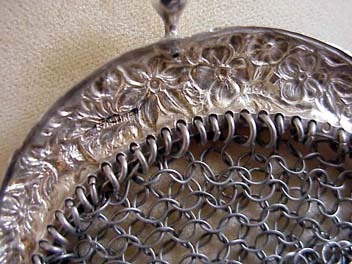 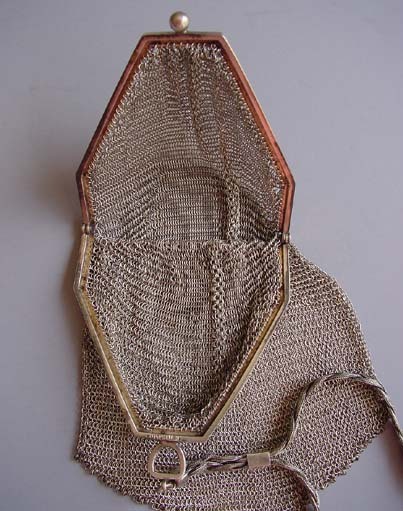 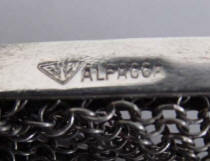 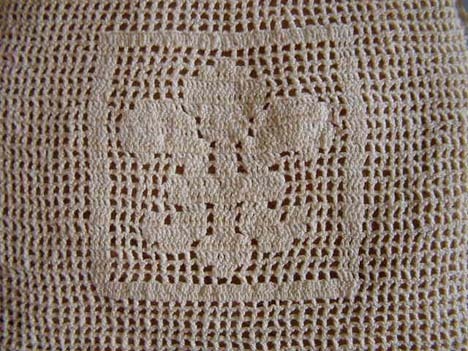 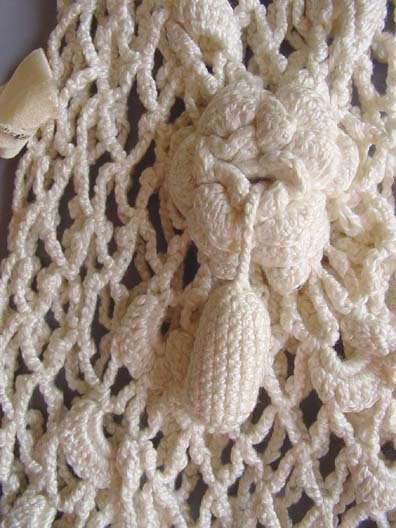 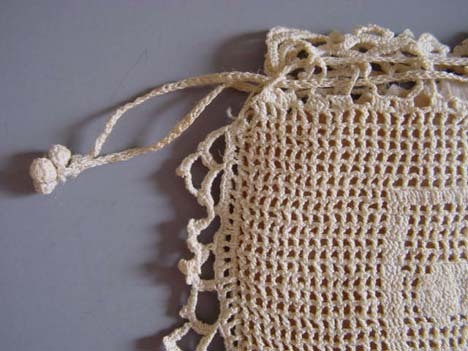 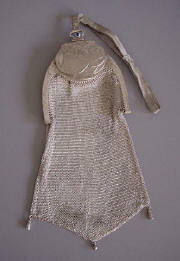 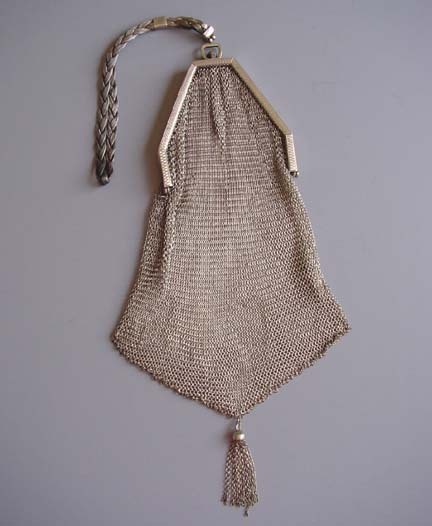 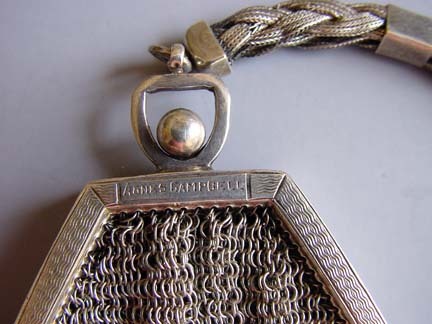 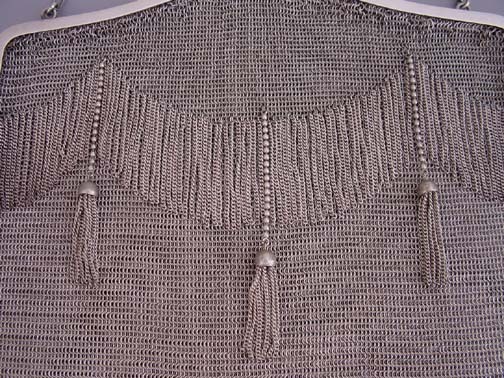 Mesh bags are still made and used today. 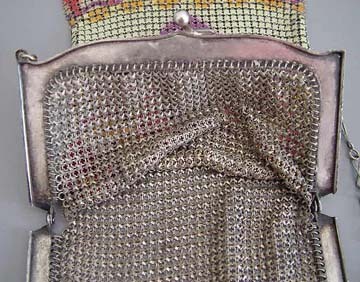 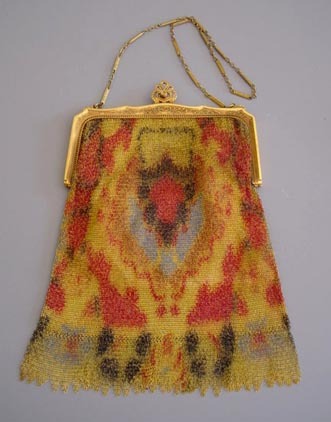 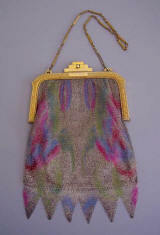 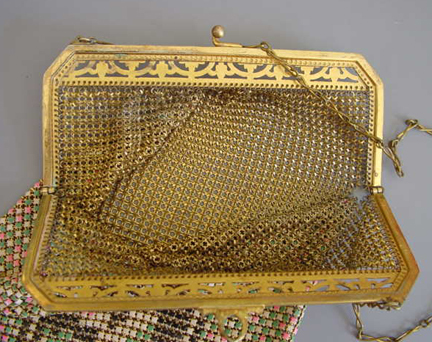 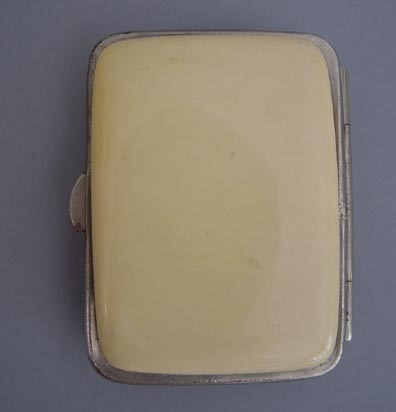 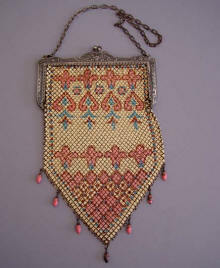 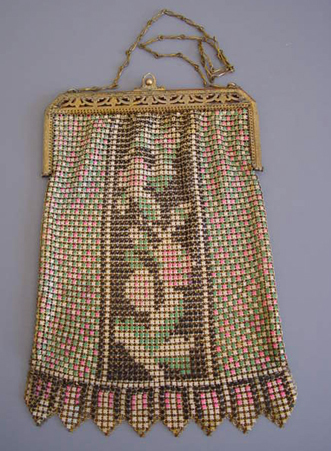 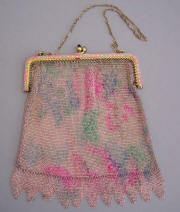 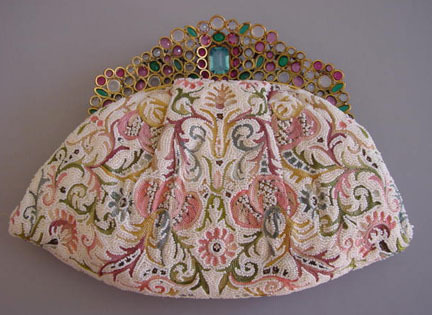 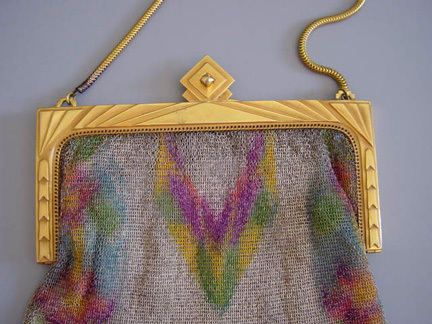 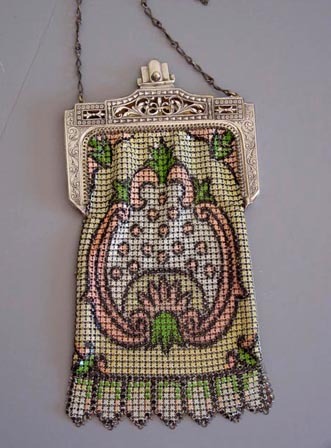 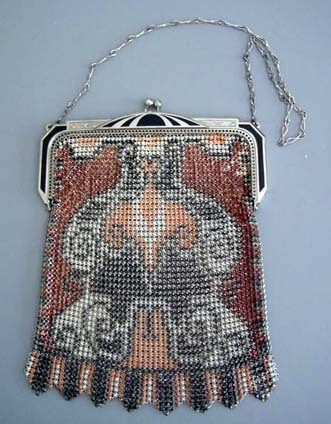 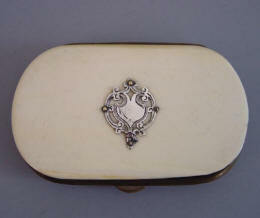 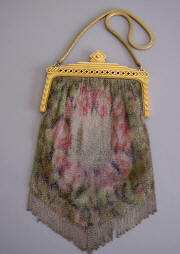 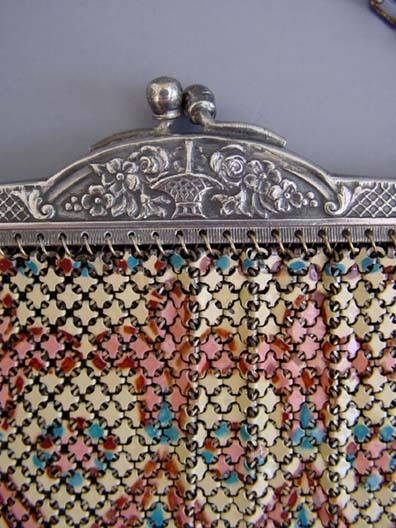 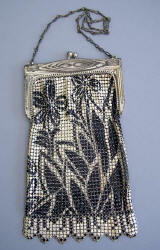 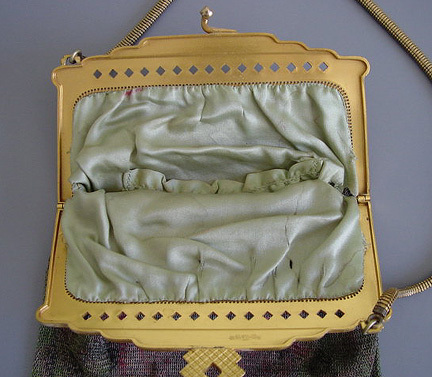 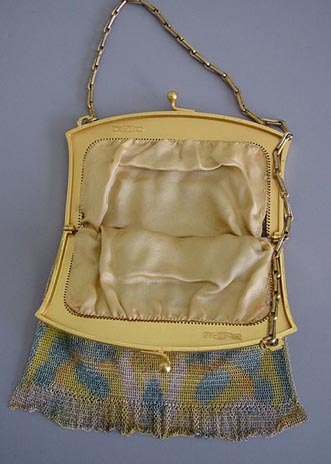 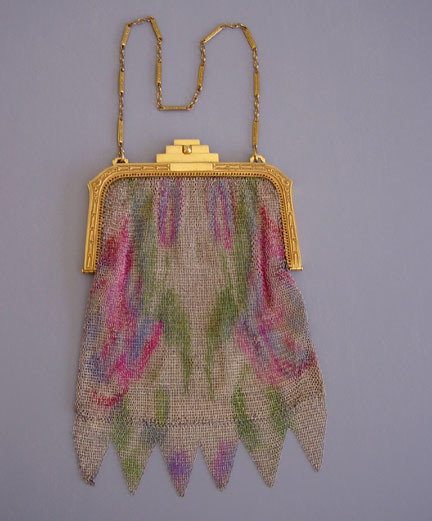 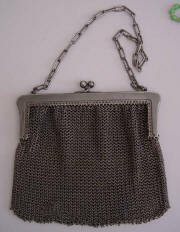 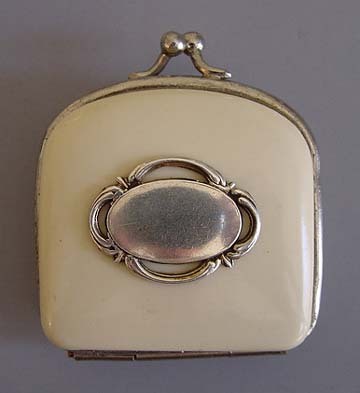 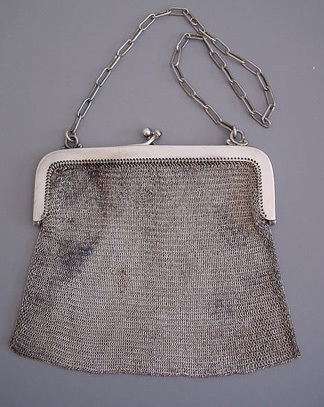 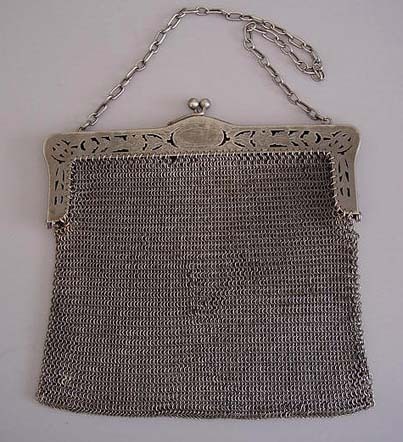 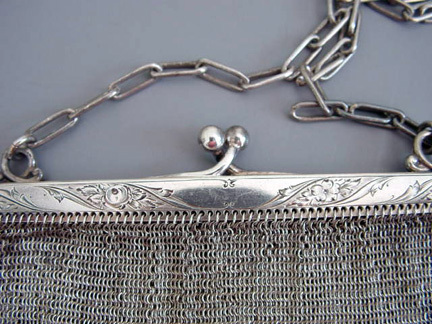 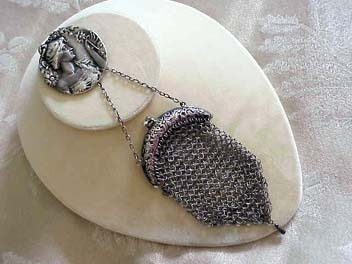 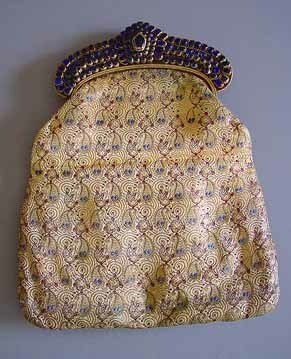 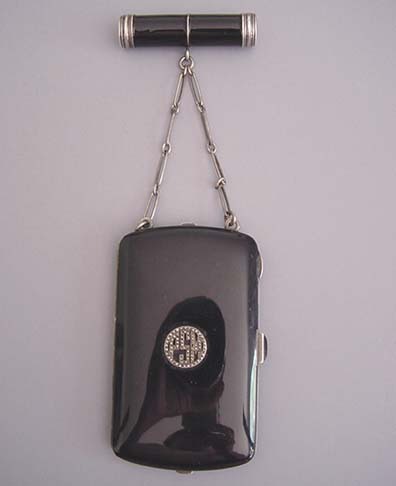 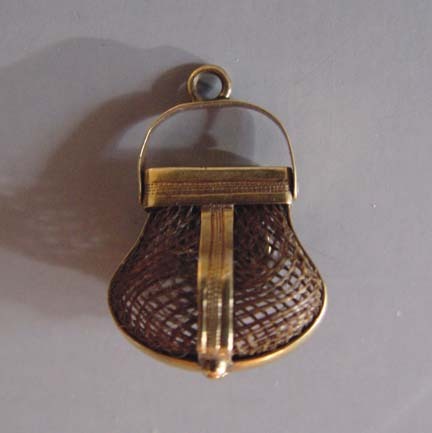 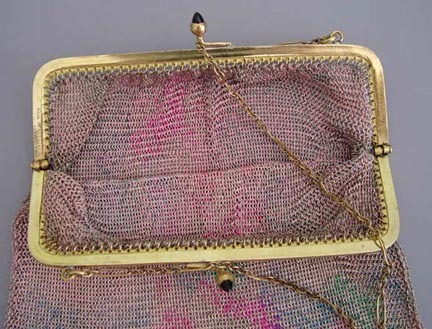 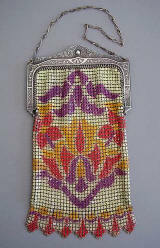 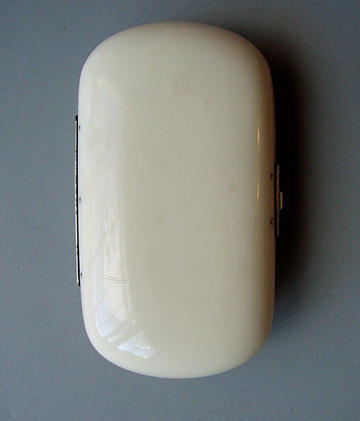 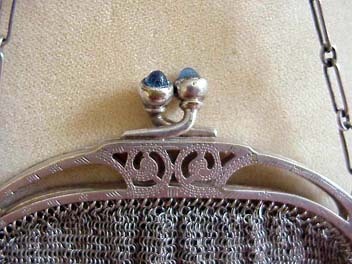 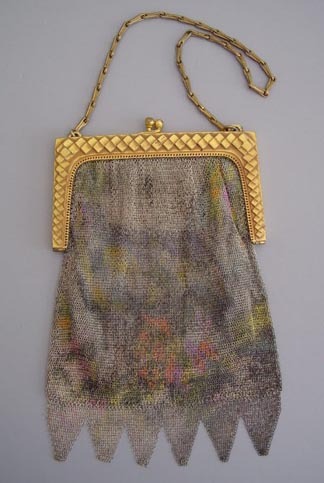 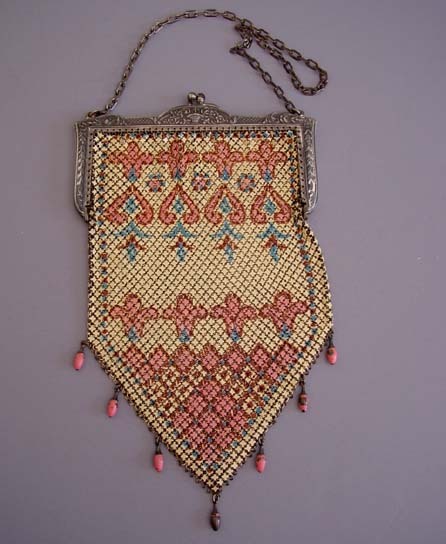 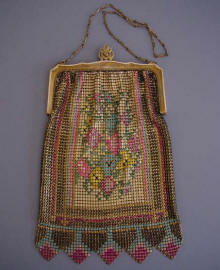 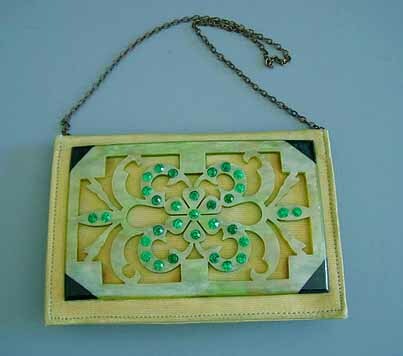 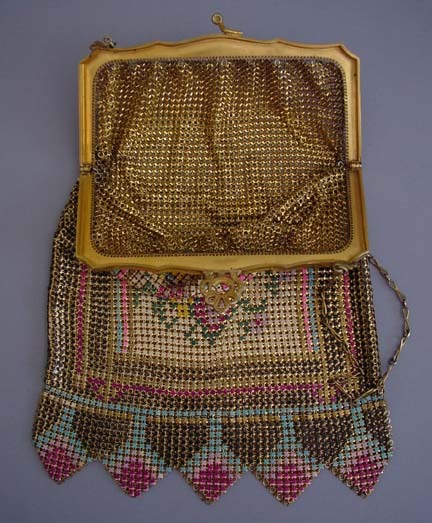 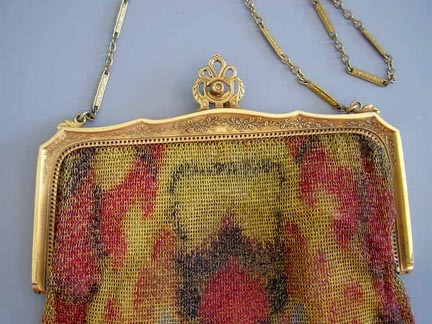 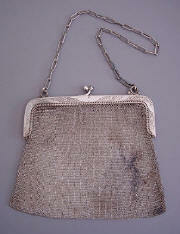 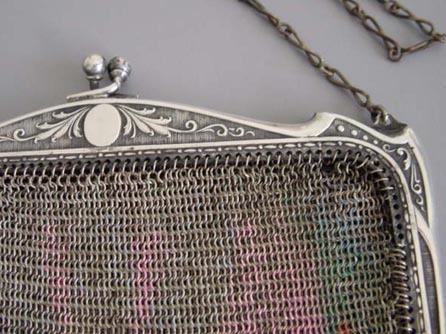 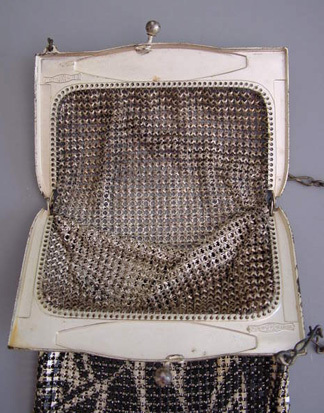 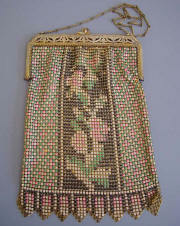 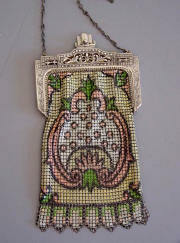 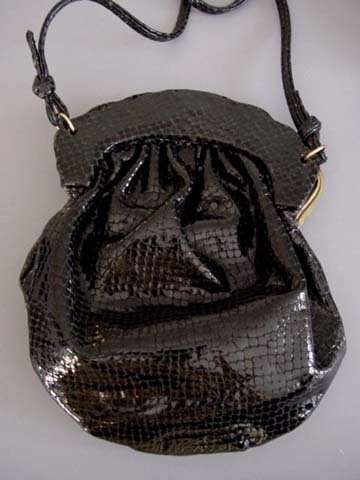 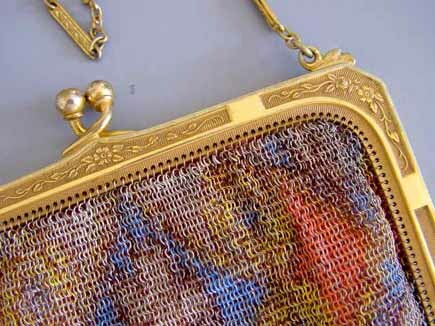 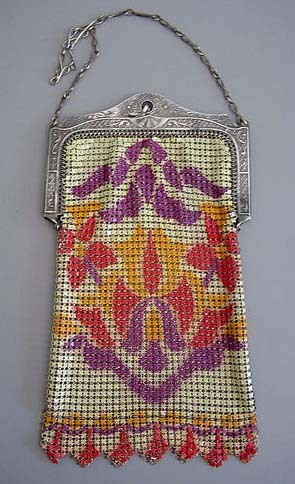 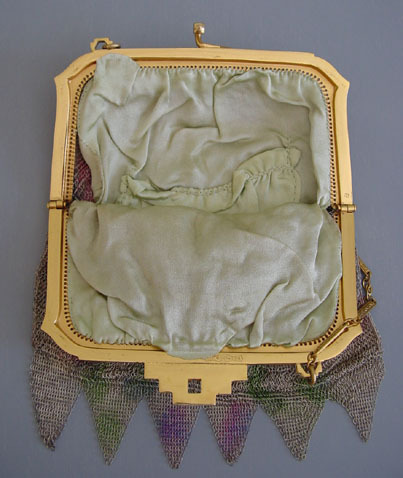 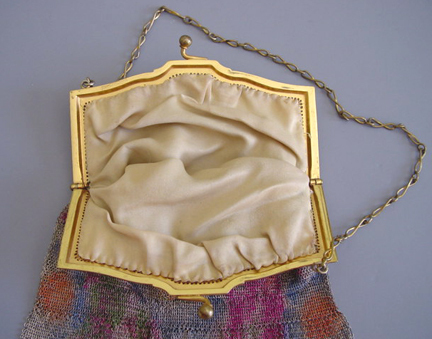 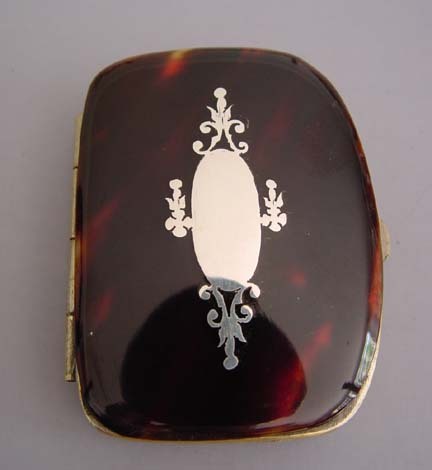 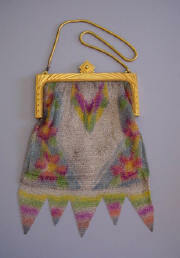 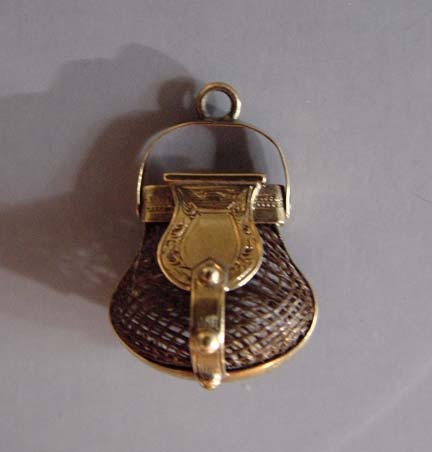 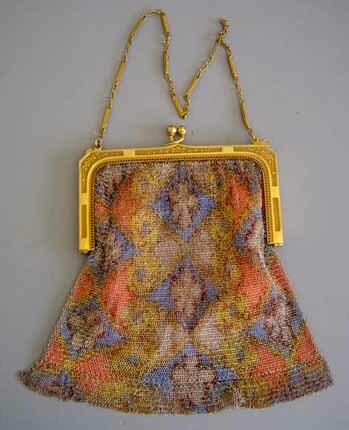 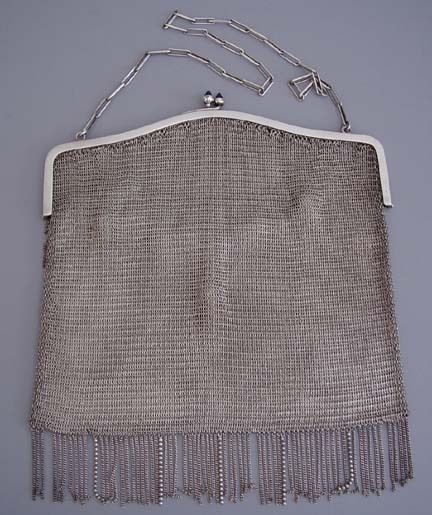 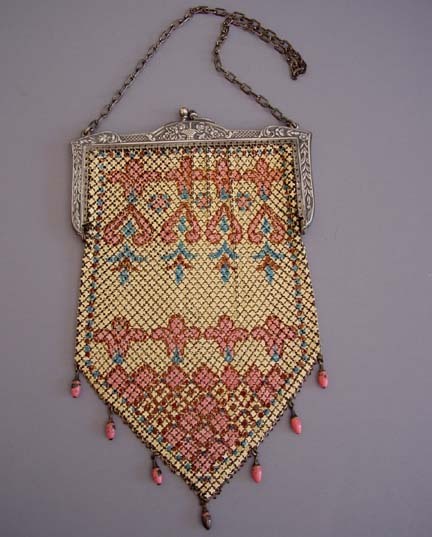 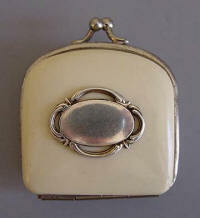 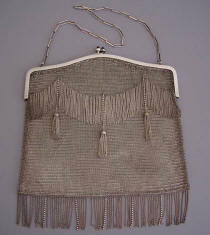 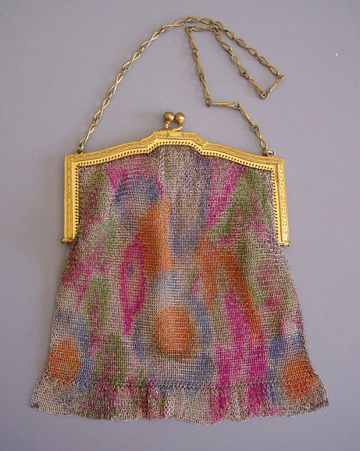 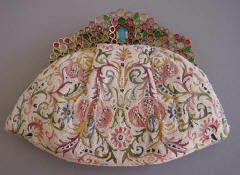 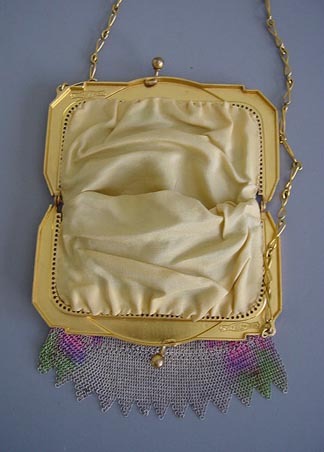 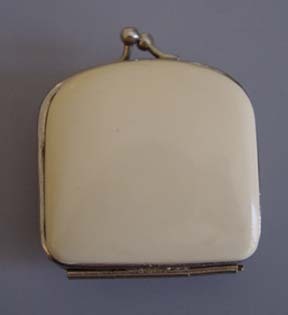 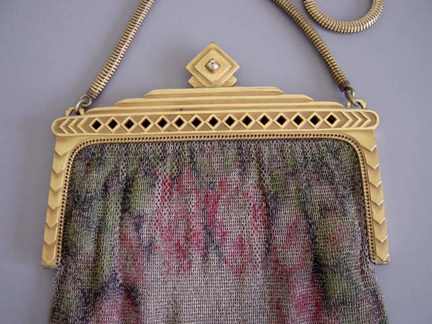 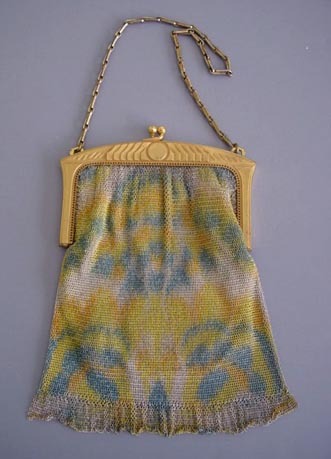 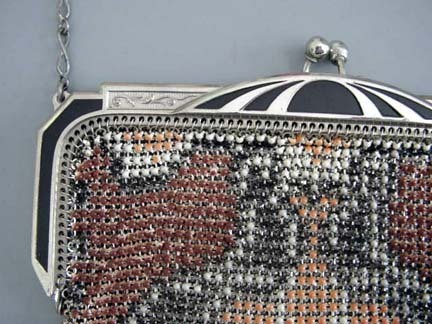 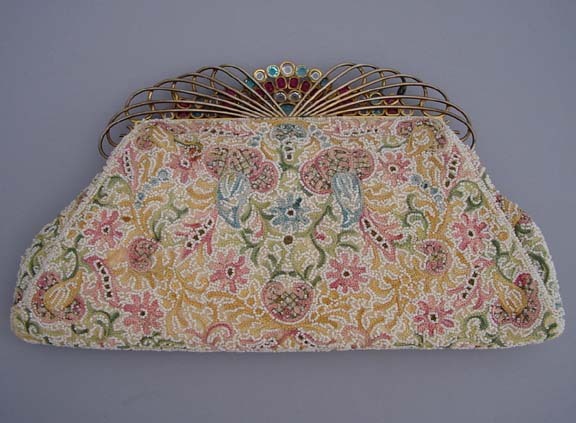 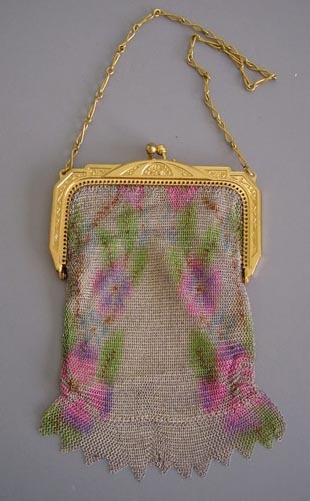 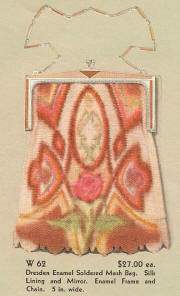 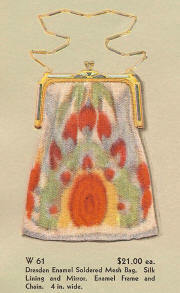 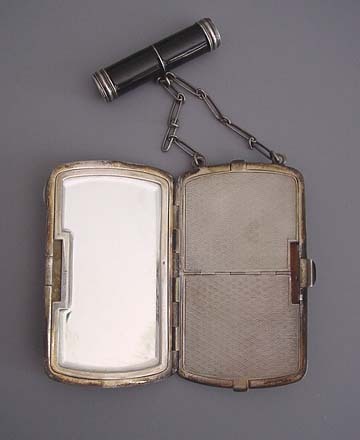 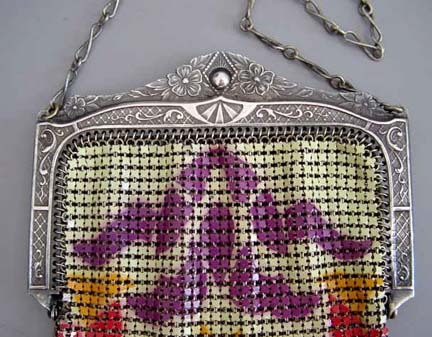 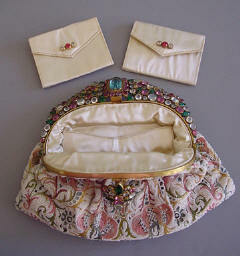 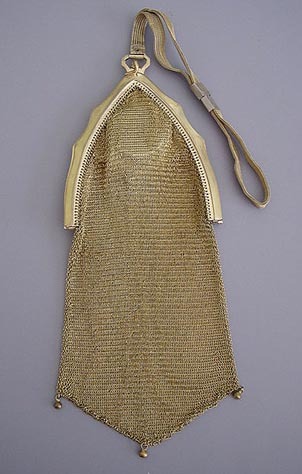 WHITING DAVIS mesh bag, "Dresden enamel soldered mesh bag, silk lining and mirror, 4" wide." 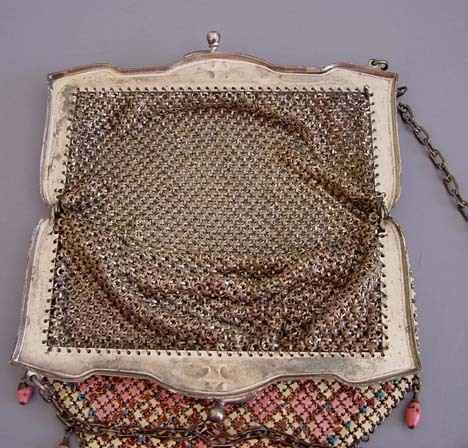 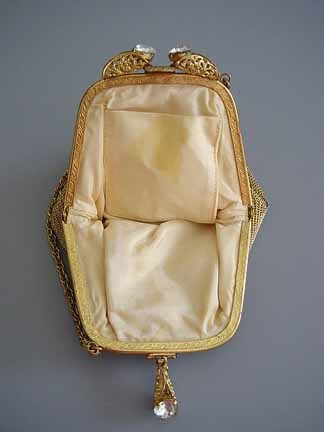 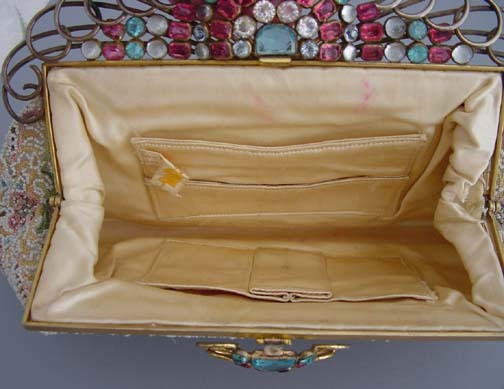 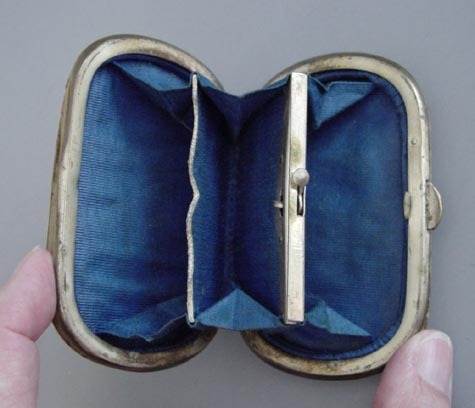 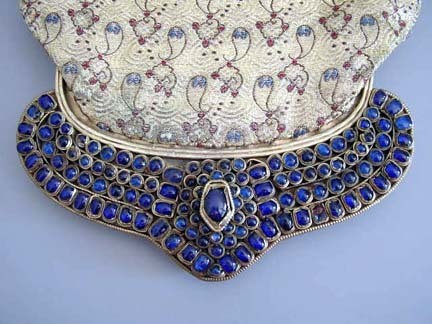 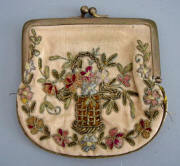 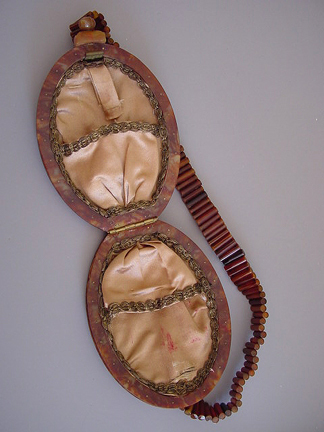 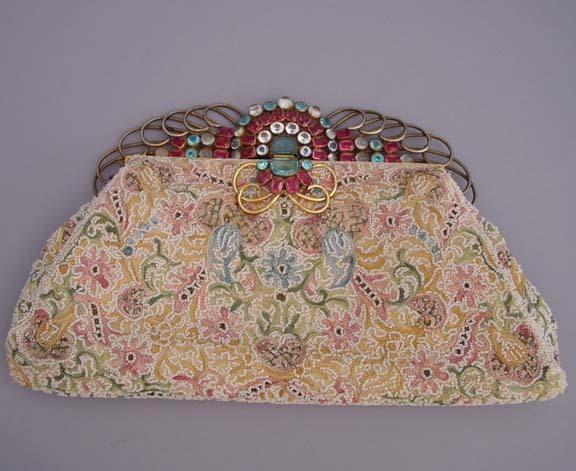 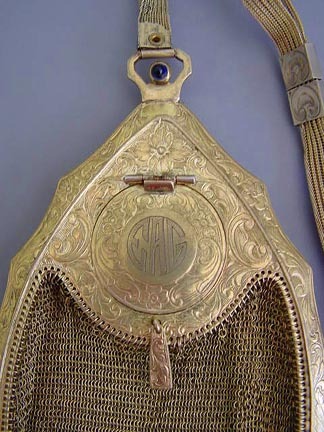 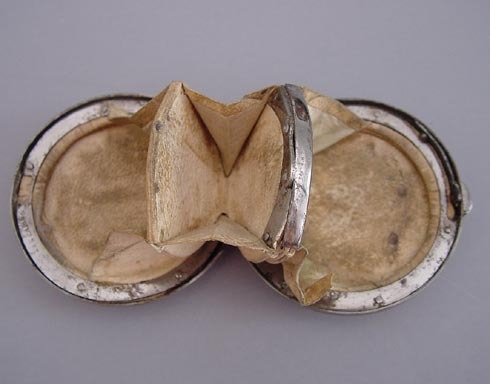 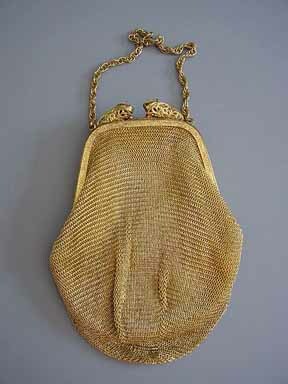 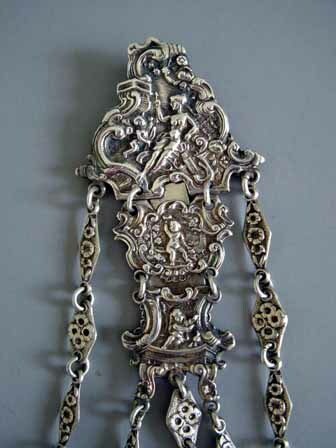 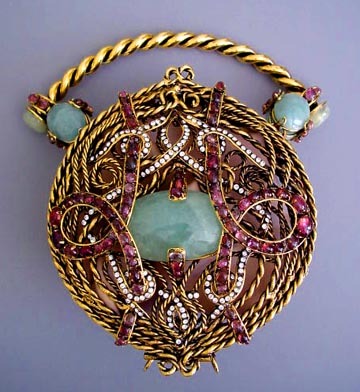 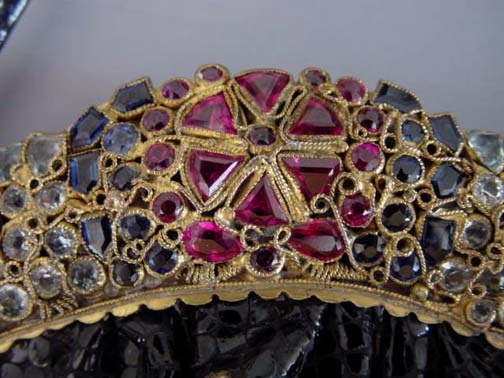 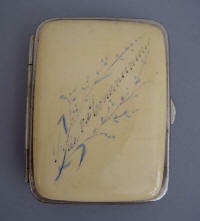 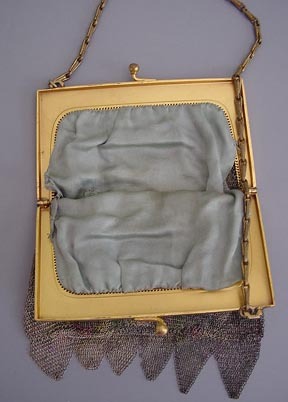 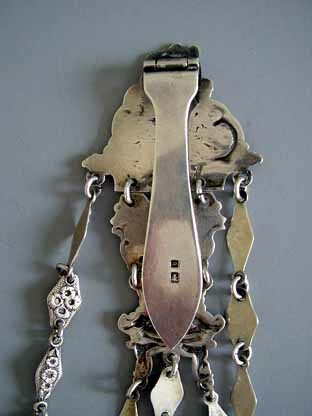 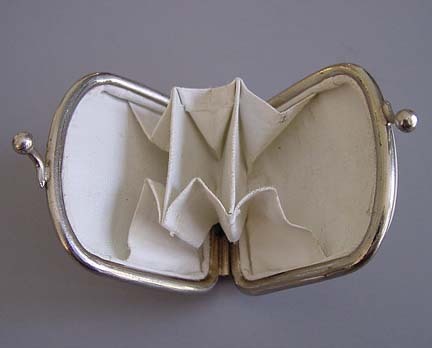 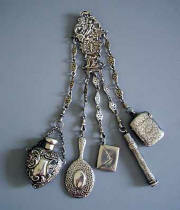 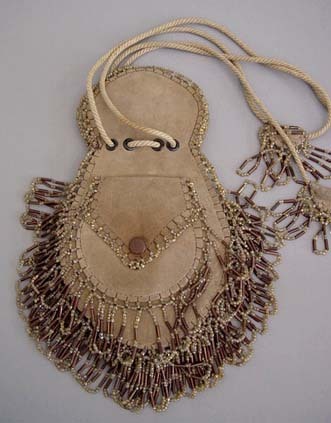 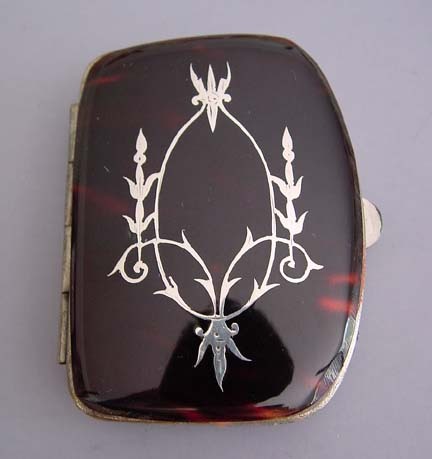 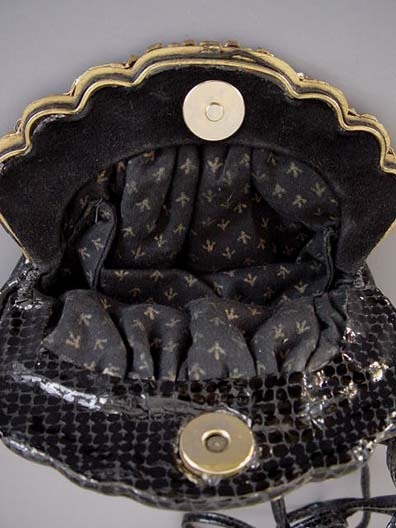 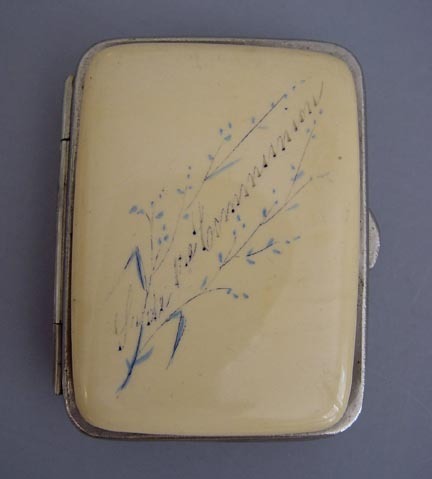 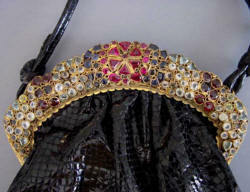 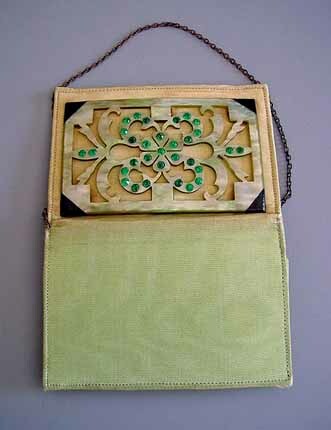 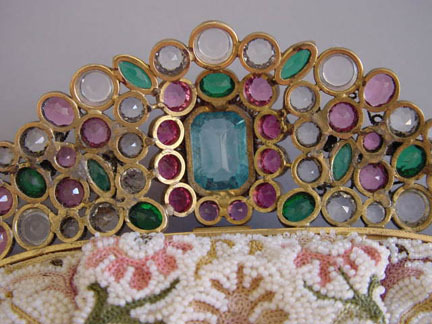 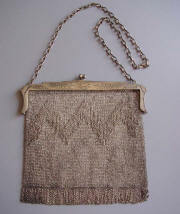 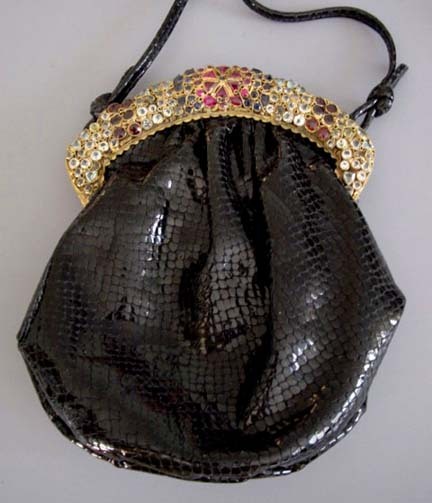 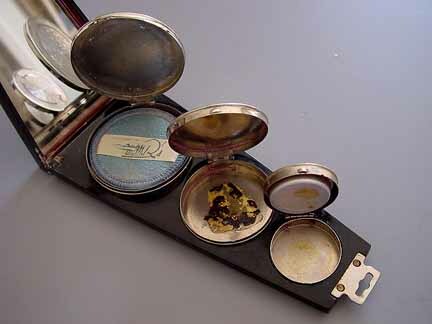 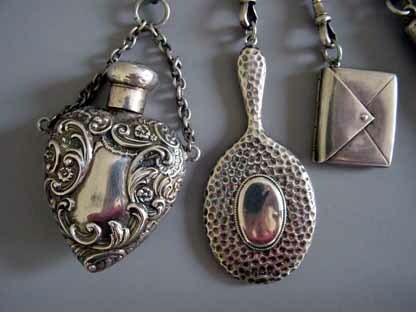 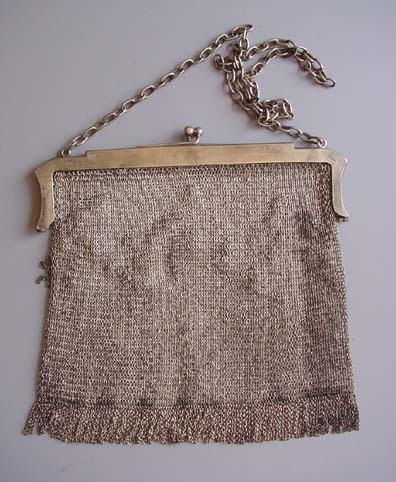 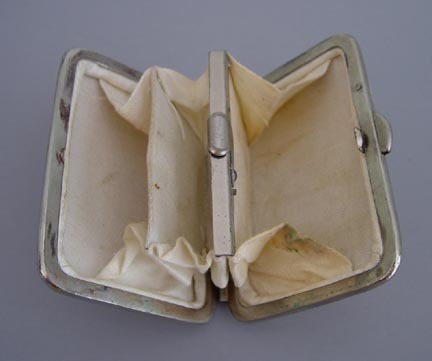 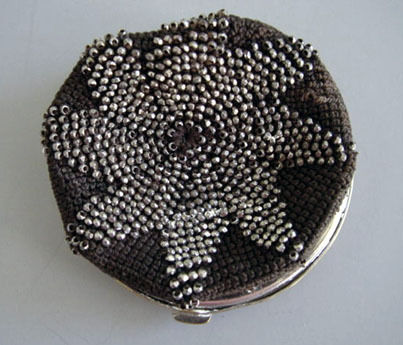 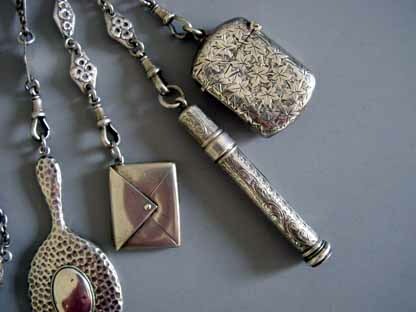 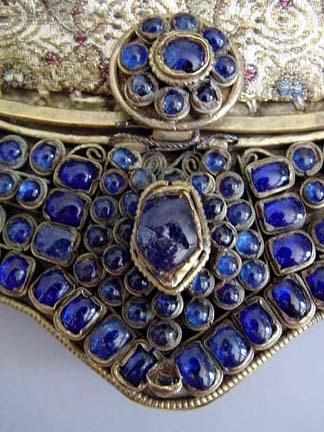 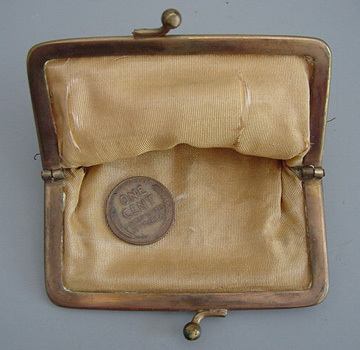 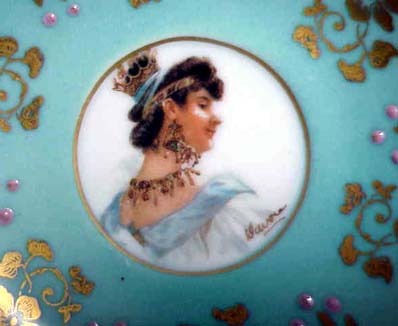 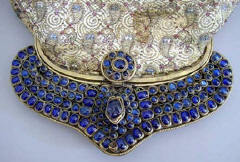 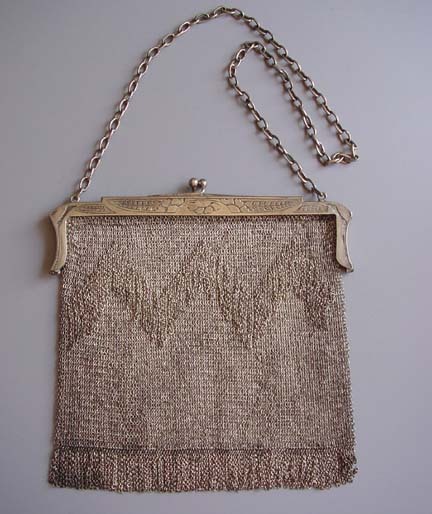 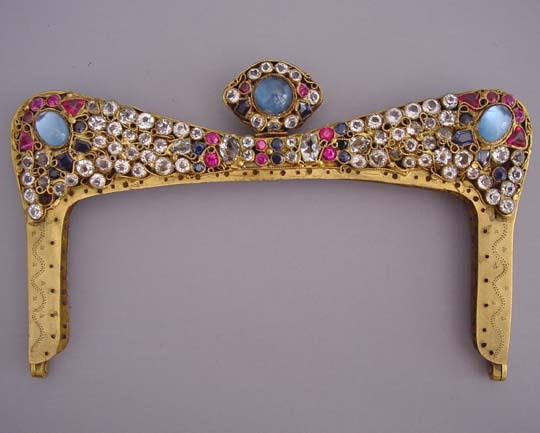 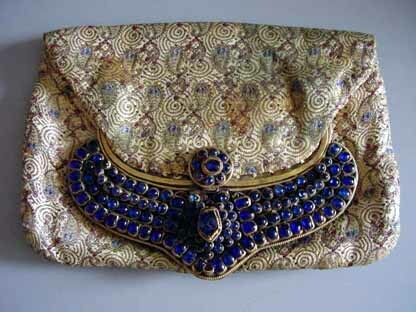 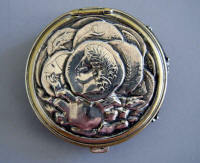 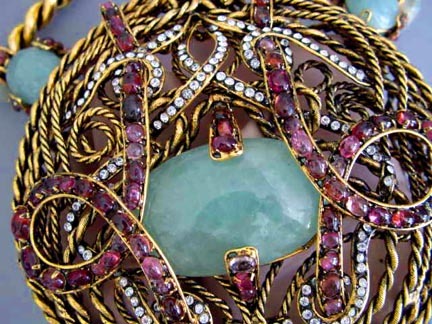 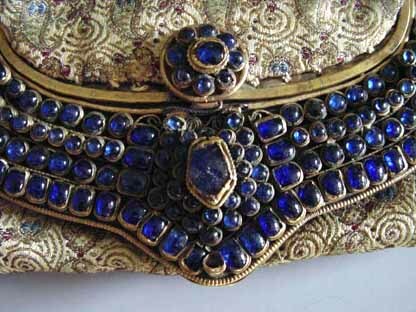 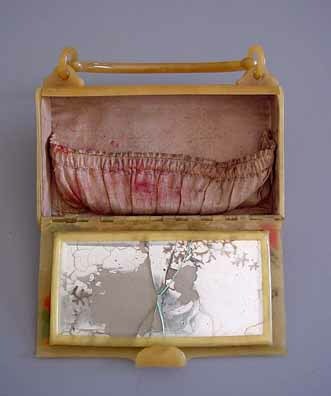 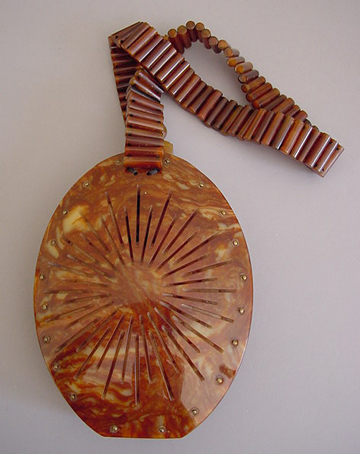 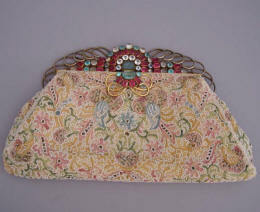 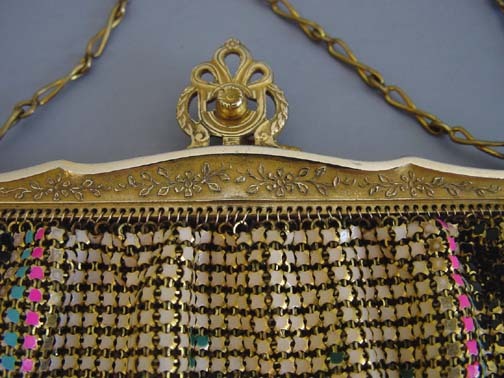 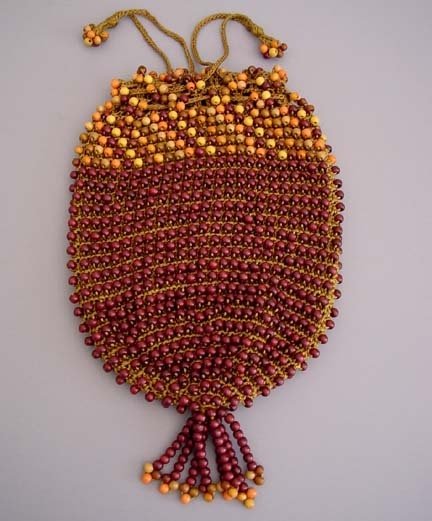 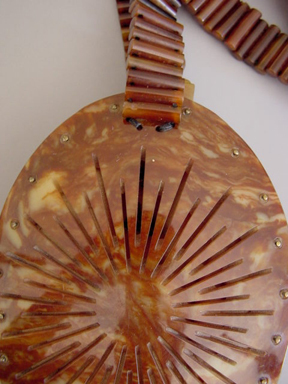 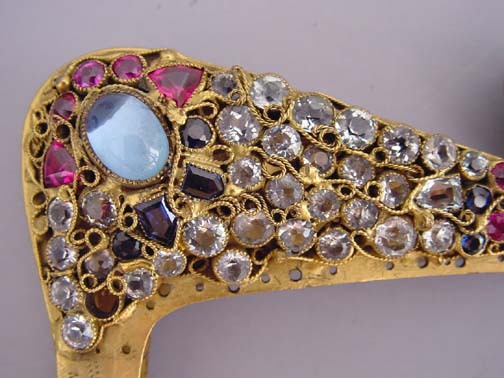 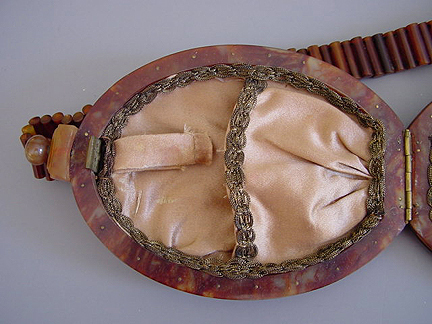 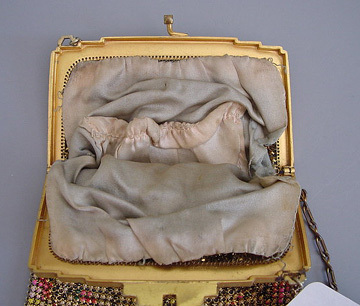 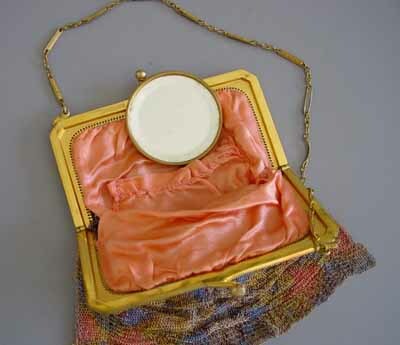 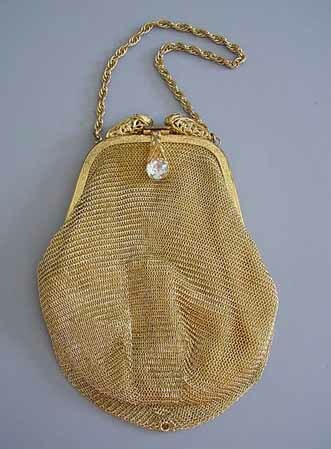 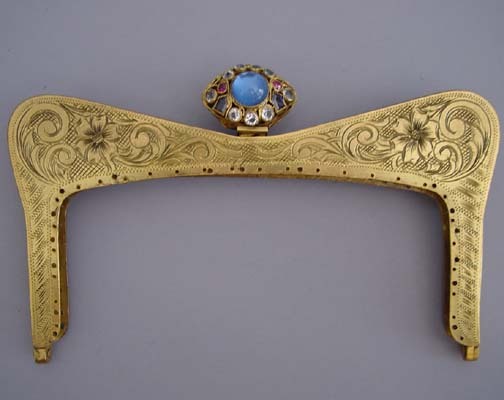 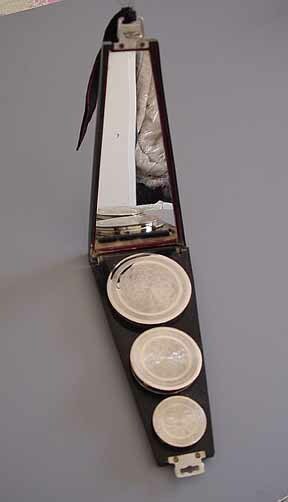 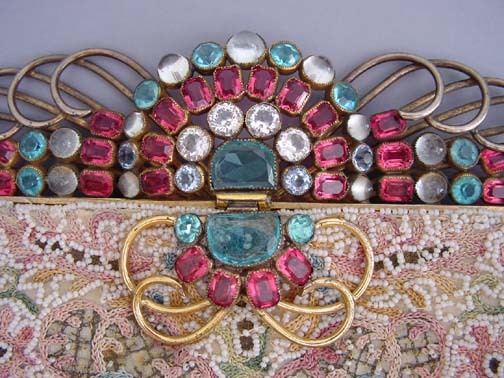 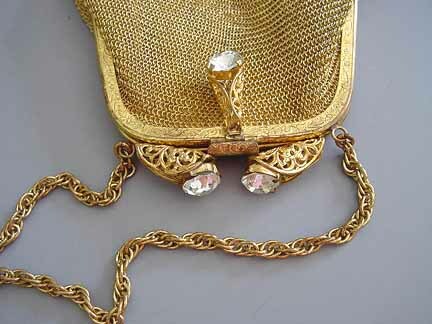 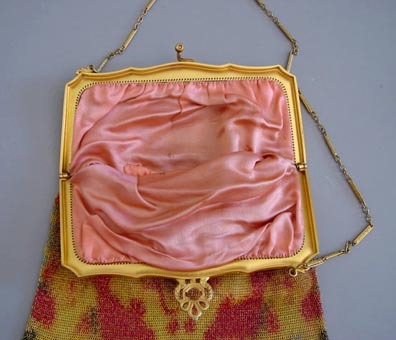 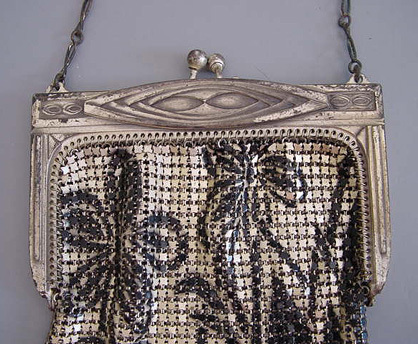 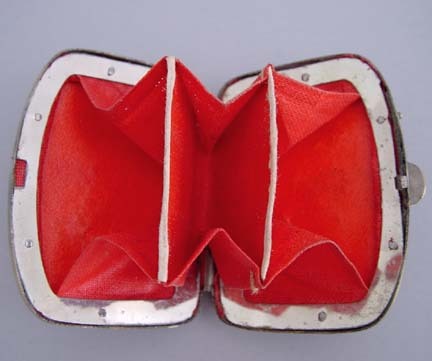 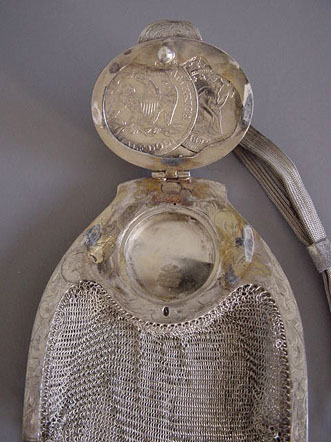 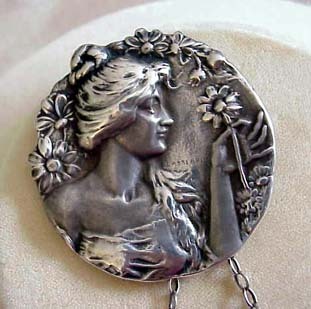 The miser's purse was in style in the mid to late 1800's. 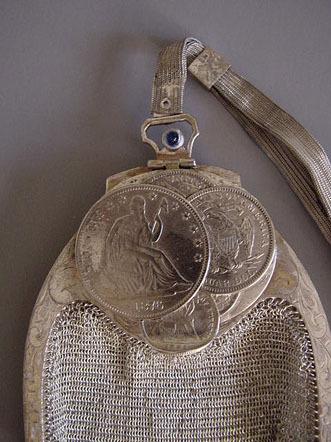 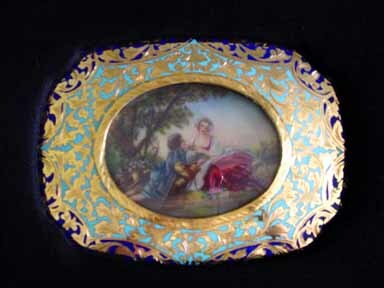 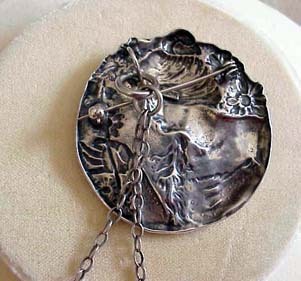 Carried by both men and women to contain money, they were flipped over a belt, held in the hand, or kept in a pocket. 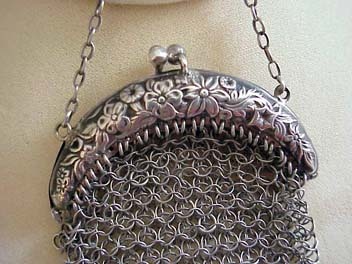 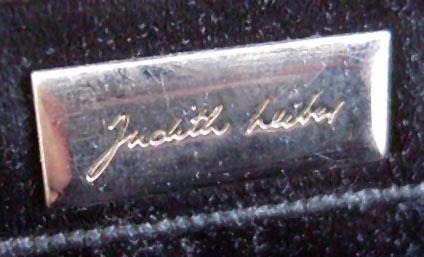 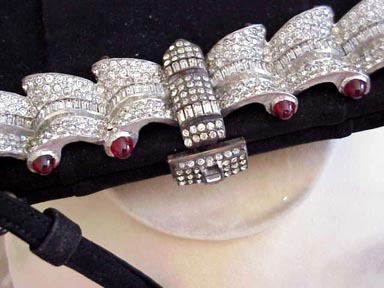 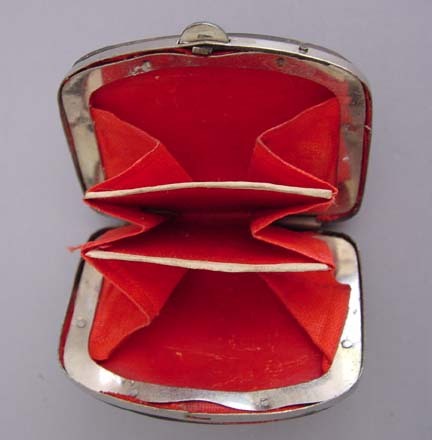 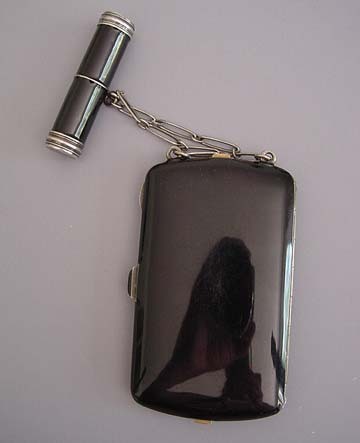 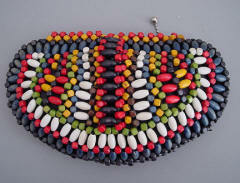 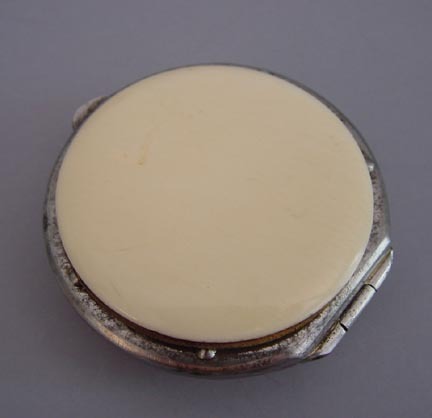 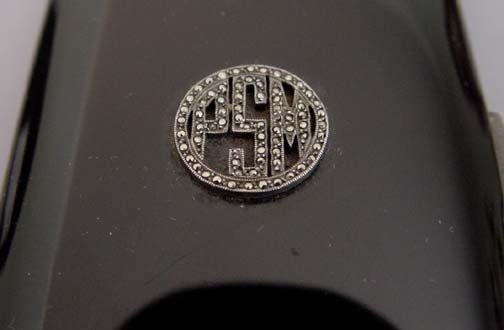 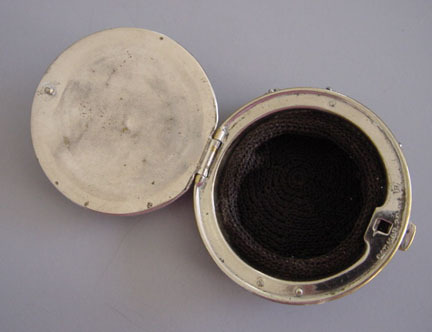 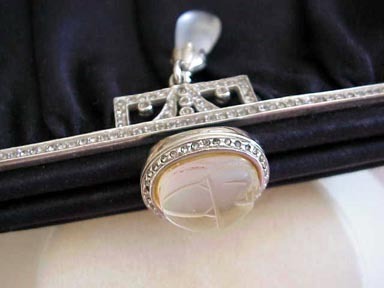 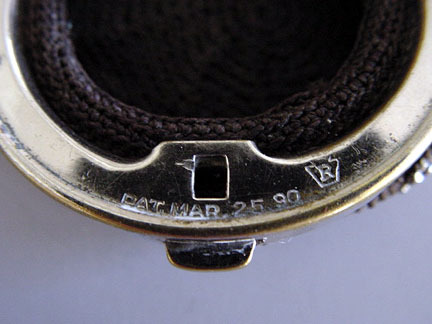 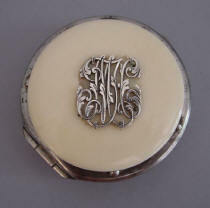 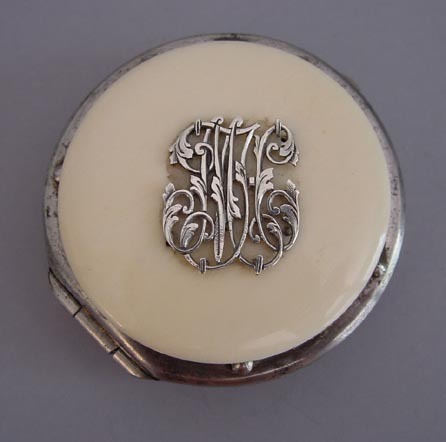 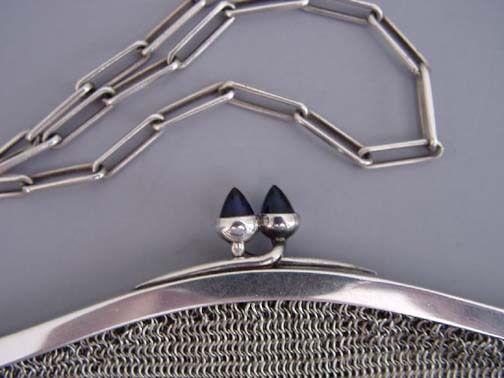 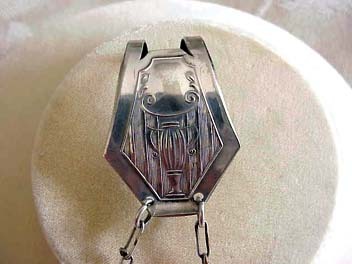 The metal rings push down to contain the coins, which were inserted into a small slit opening at the middle of the bag. 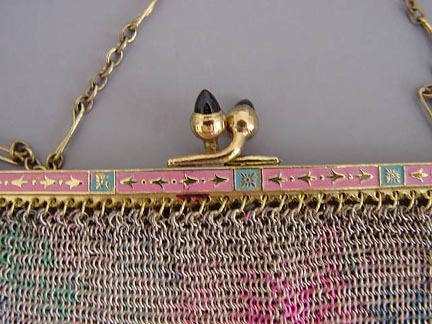 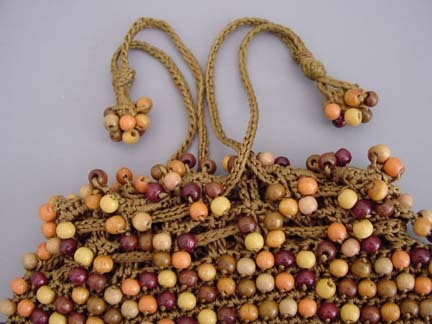 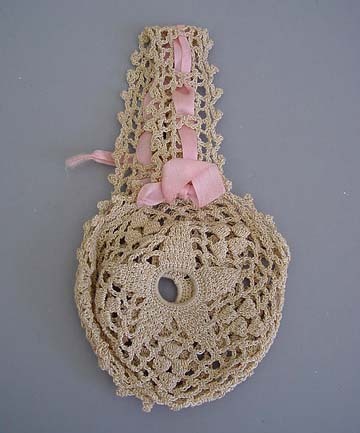 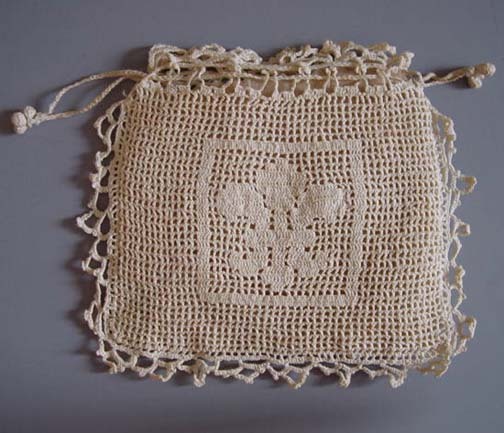 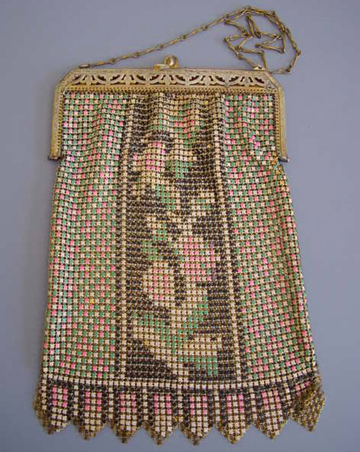 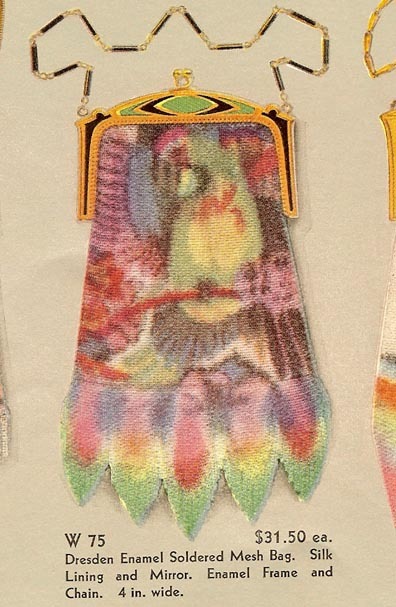 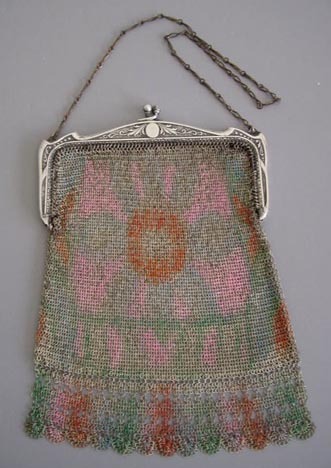 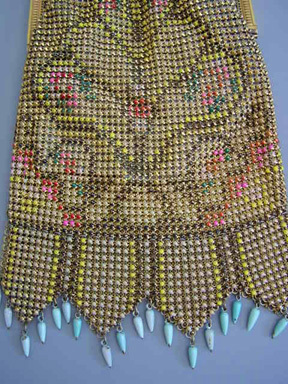 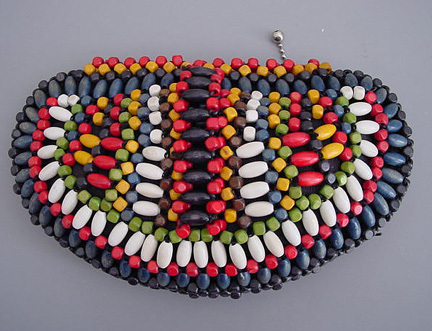 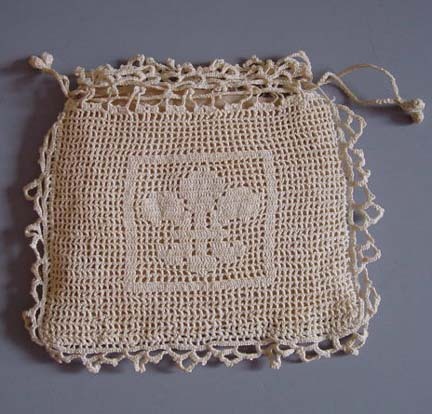 These purses were usually either knitted or crocheted, and were often hand made from patterns found in the magazines of the time. 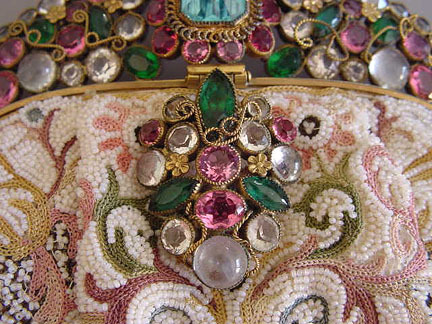 Whether plain fabric or fancy bead worked bodies, these purses are enhanced by semi-precious gems and rhinestone studded frames. 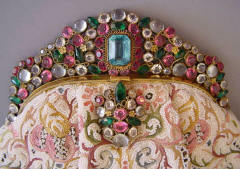 HOBE unsigned purse with tambour stitched and beaded and embroidered body, aqua, pink, clear and green rhinestone frame. 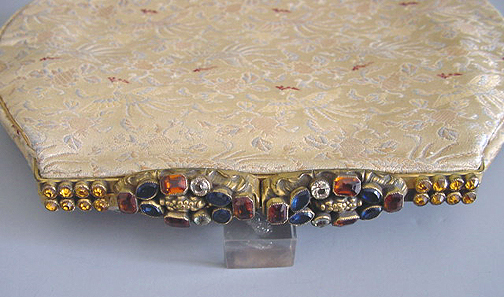 It is 9" wide at the bottom and 7" top to bottom. 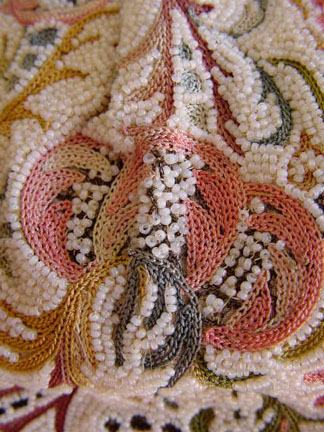 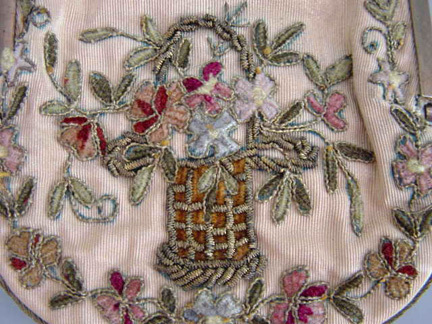 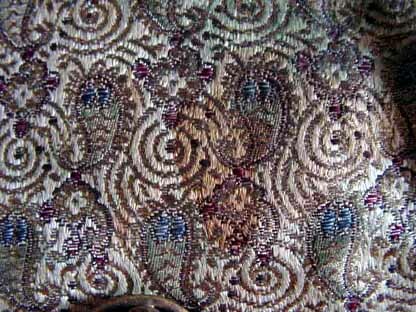 #P23864 DETAIL of beaded and embroidered body. 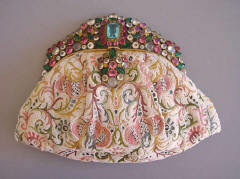 HOBE unsigned purse with beaded and embroidered body, aqua, pink, clear and green rhinestone frame. 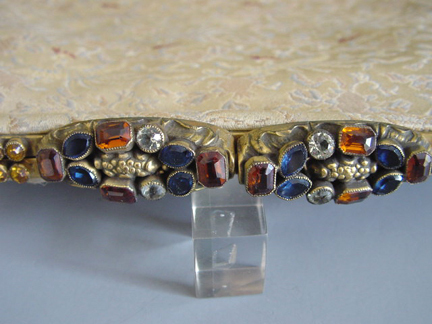 It is 9" wide at the bottom and 7" top to bottom. 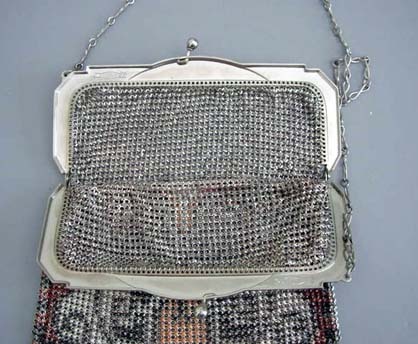 #P23864 Purse and accessories, including two satin pouches with jeweled snap and plastic comb. 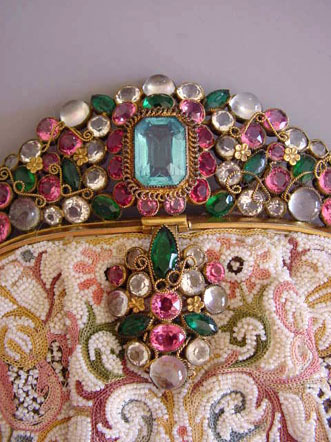 HOBE unsigned purse with beaded and embroidered body, aqua, pink, clear and green rhinestone frame. 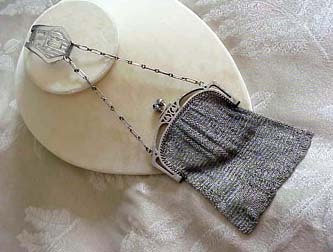 It is 9" wide at the bottom and 7" top to bottom. 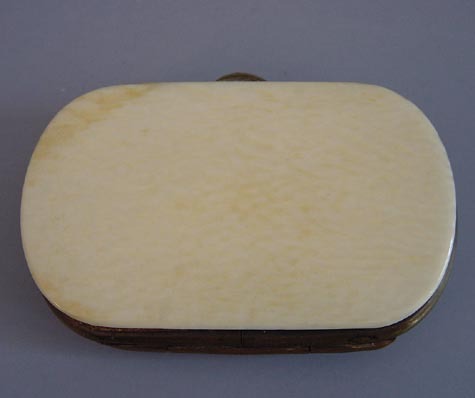 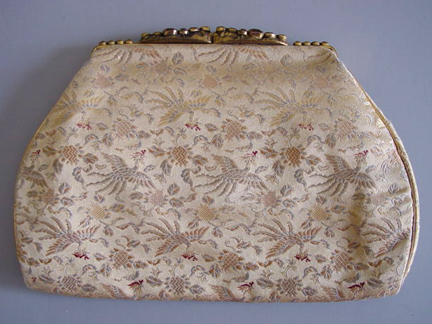 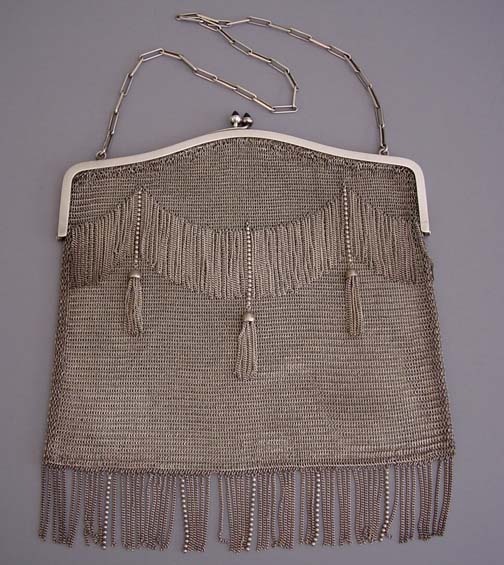 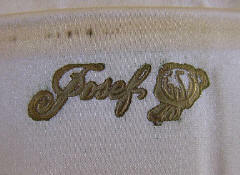 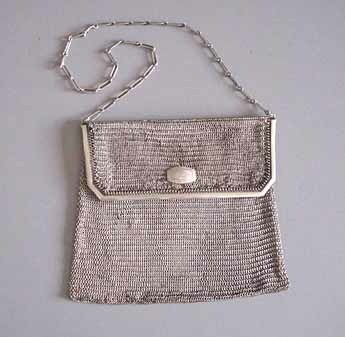 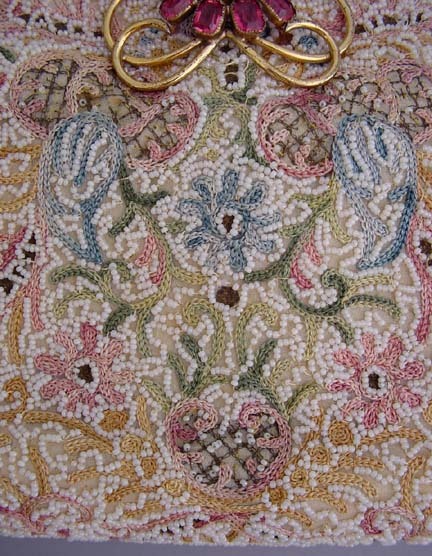 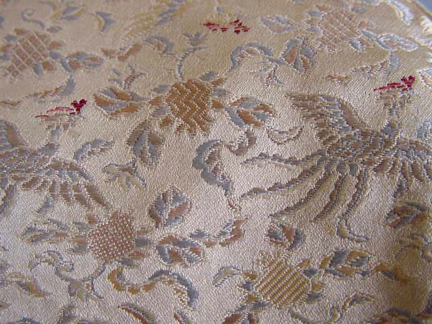 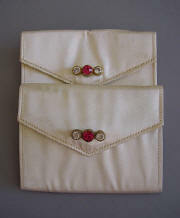 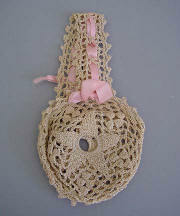 #P23864 Purse is lined in cream colored fabric. HOBE unsigned purse with beaded and embroidered body, aqua, pink, clear and green rhinestone frame. 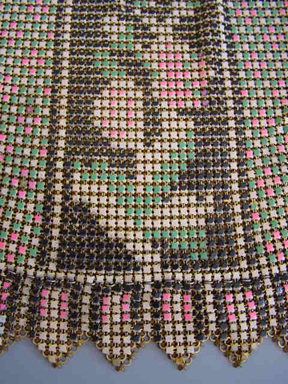 It is 9" wide at the bottom and 7" top to bottom. 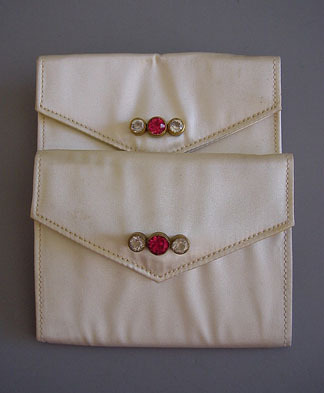 #P23864 Matching jeweled pouches. 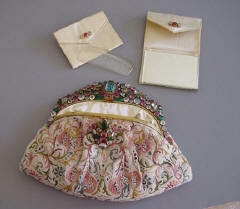 HOBE unsigned purse with beaded and embroidered body, aqua, pink, clear and green rhinestone frame. 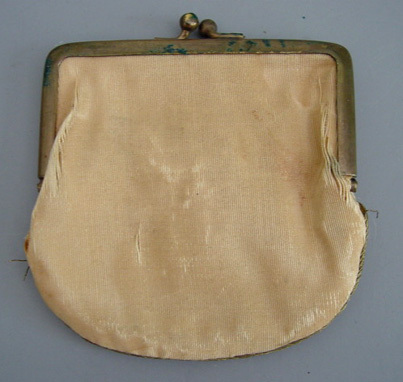 It is 9" wide at the bottom and 7" top to bottom. 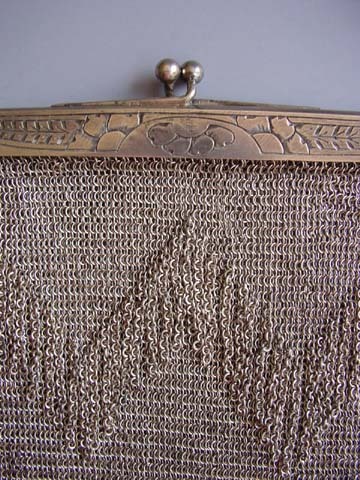 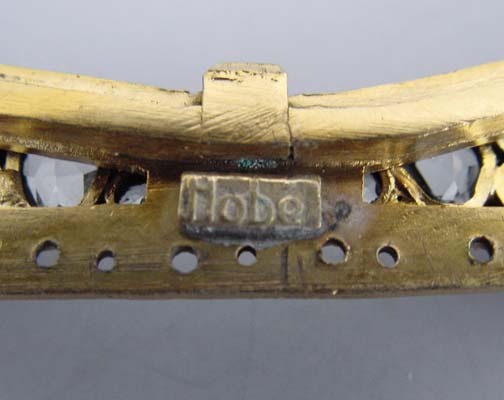 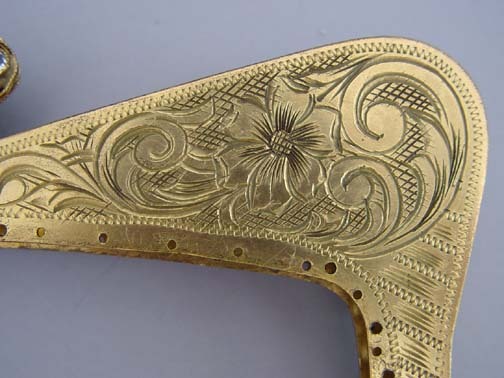 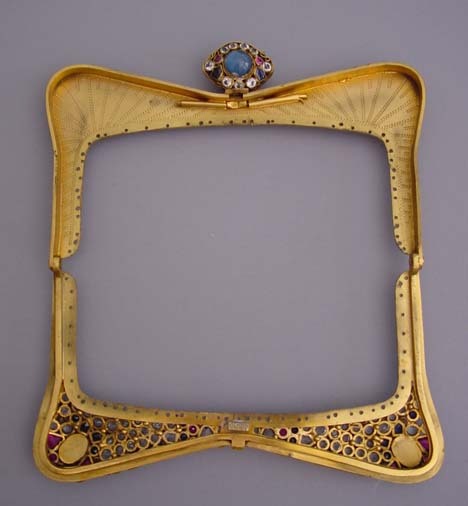 #P23864 Back view of frame. 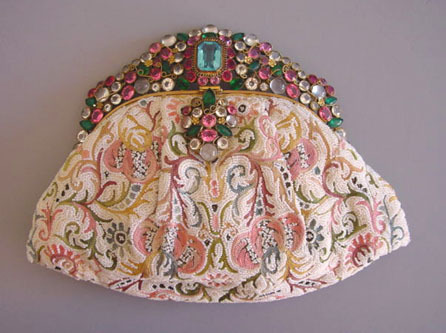 HOBE unsigned purse with beaded and embroidered body, aqua, pink, clear and green rhinestone frame. 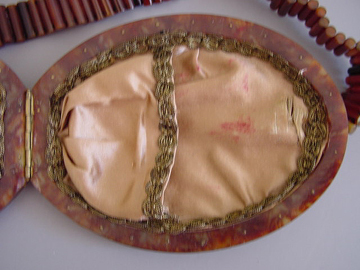 It is 9" wide at the bottom and 7" top to bottom. 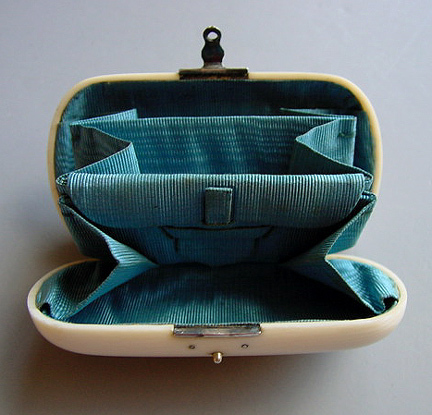 #P23864 Mark inside one of the pouches. 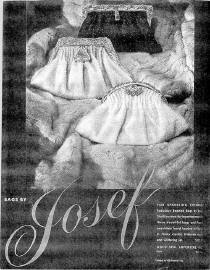 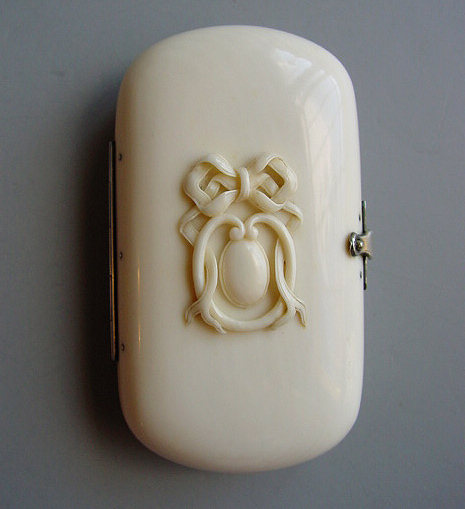 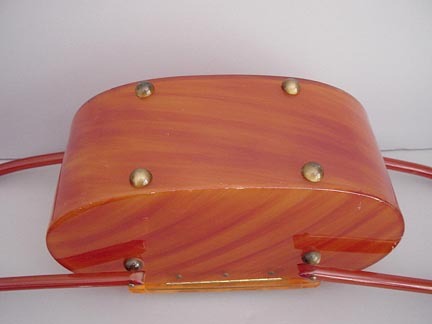 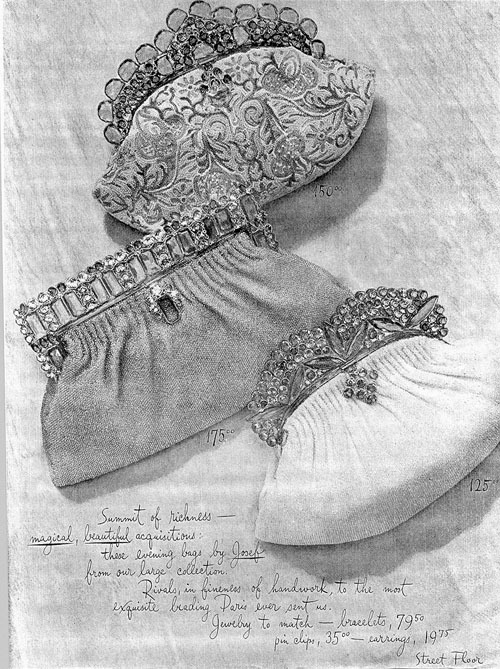 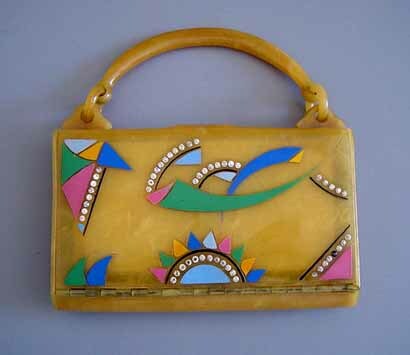 Josef of Paris made fabulous handbags. 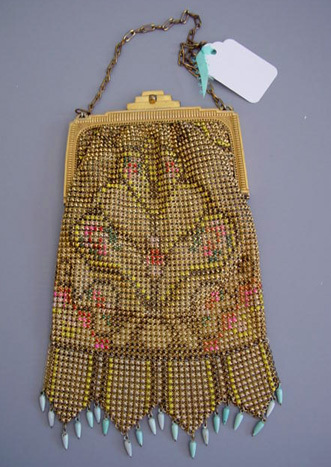 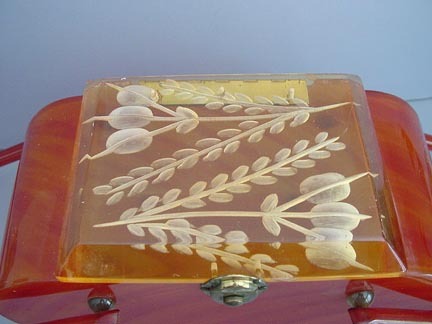 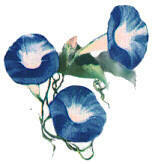 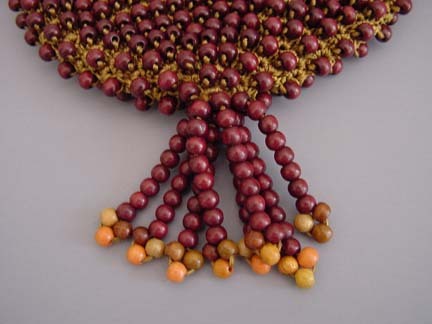 They were beaded in France and then imported. In 1946, when this ad came out, the price of the purse was $125.00. 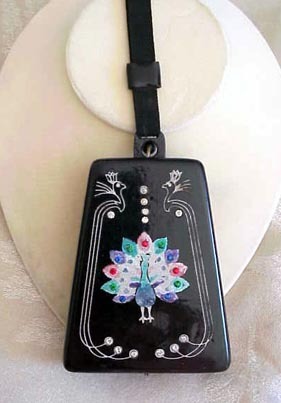 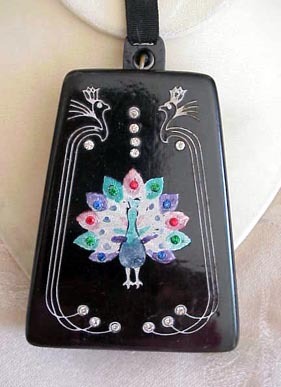 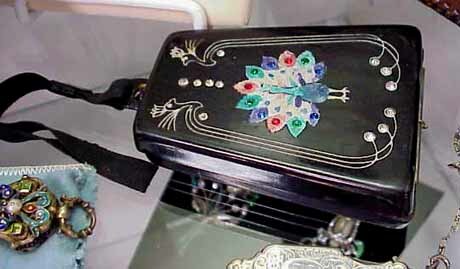 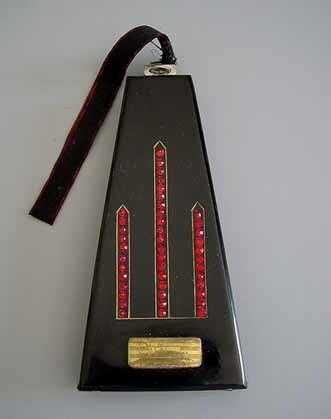 DECO plastic colorful peacock on a black background purse with interior fittings. 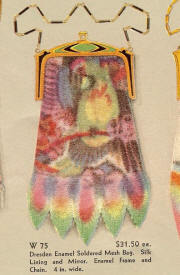 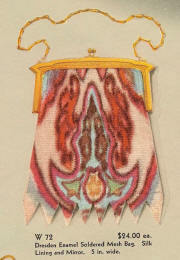 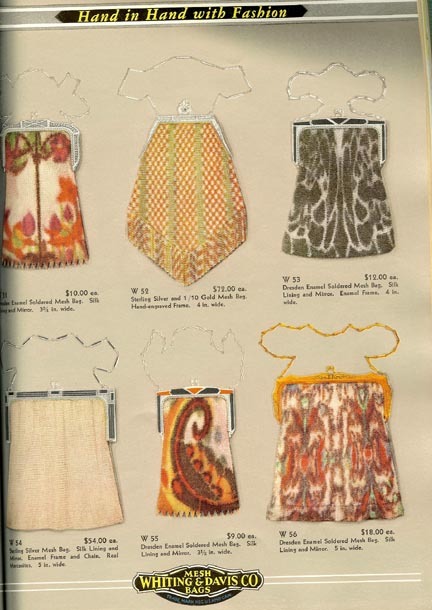 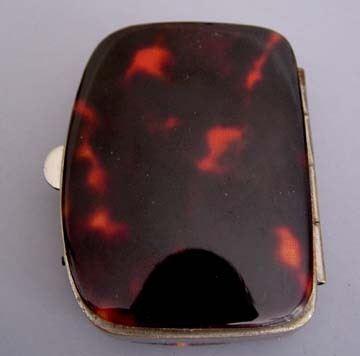 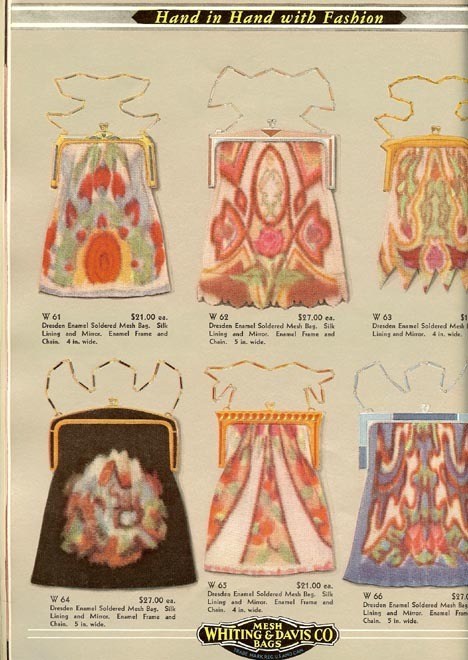 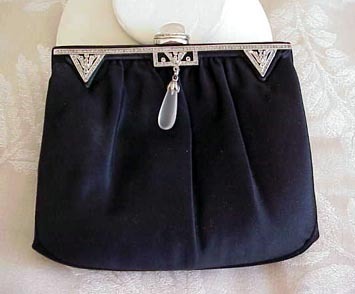 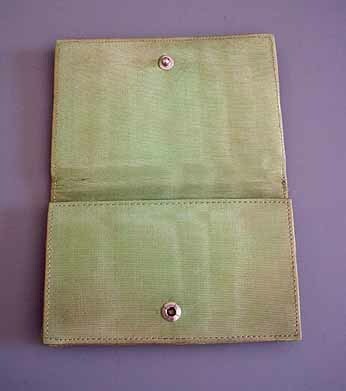 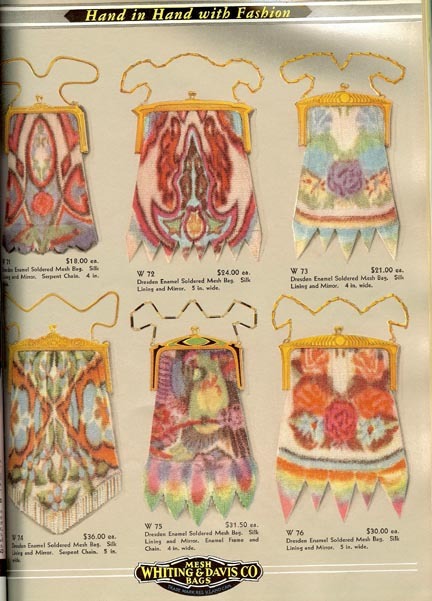 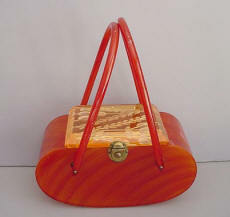 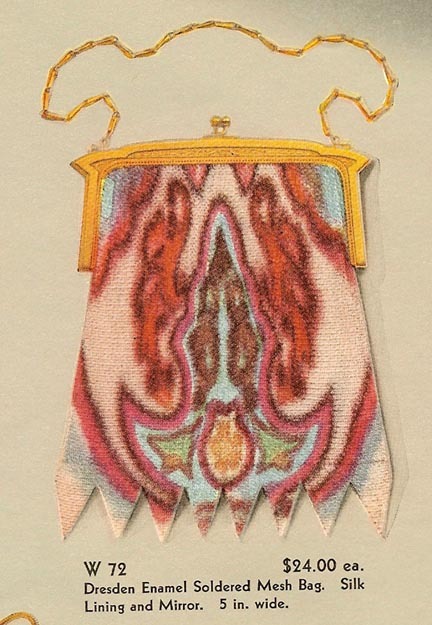 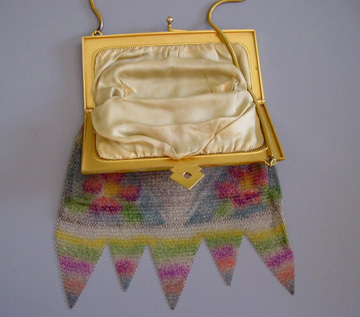 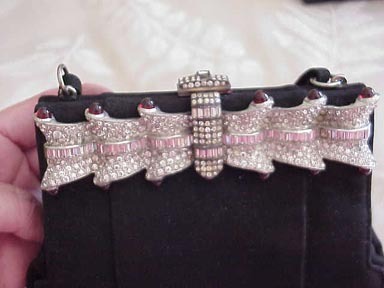 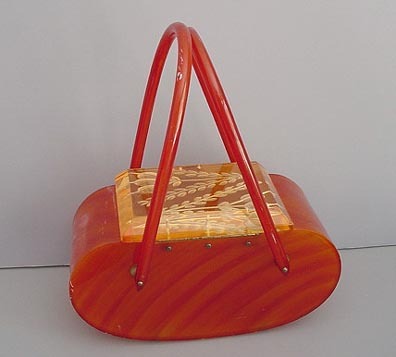 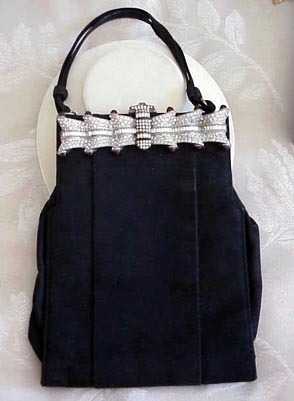 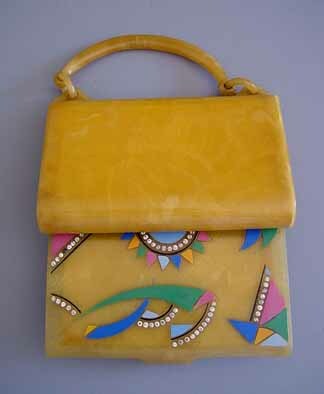 Similar purses can be seen on page 545 of Haertig's More Beautiful Purses.